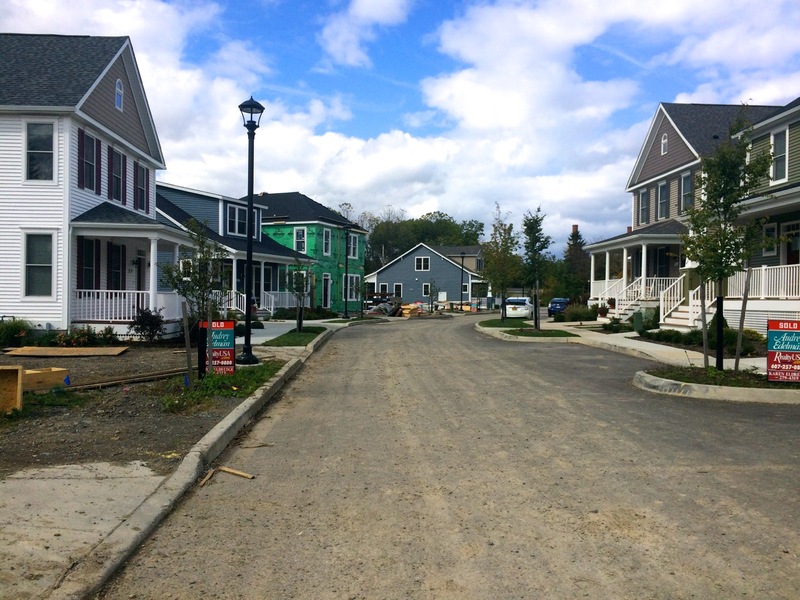 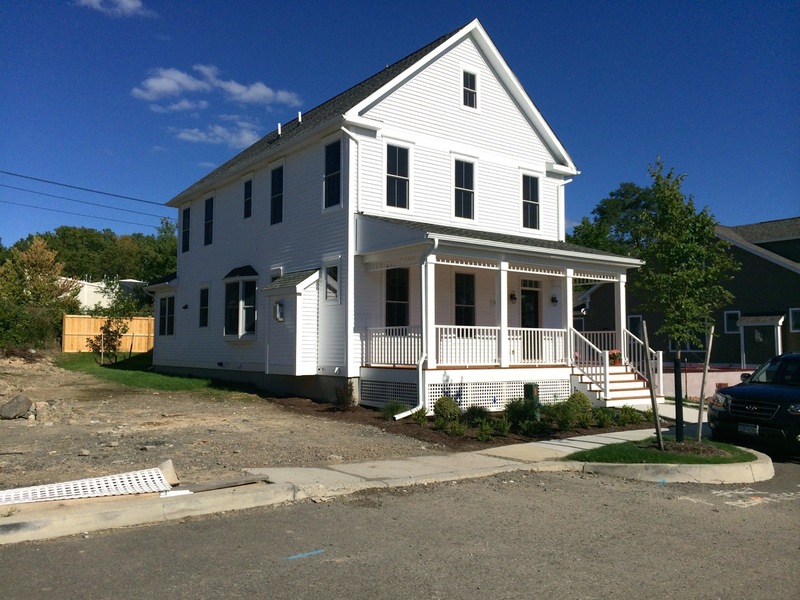 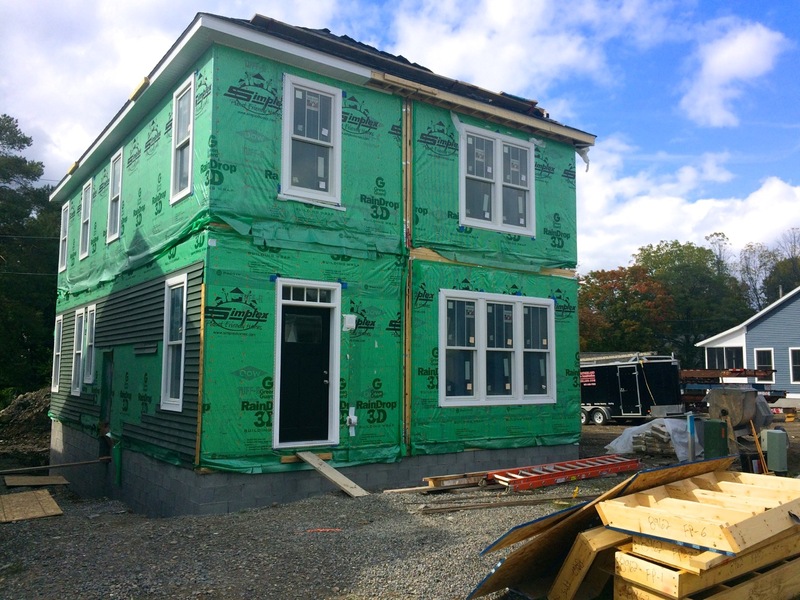 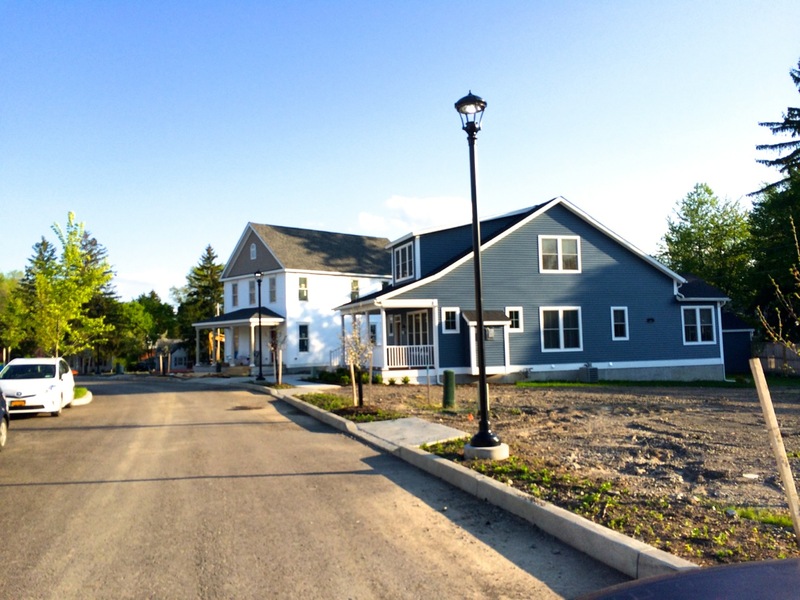 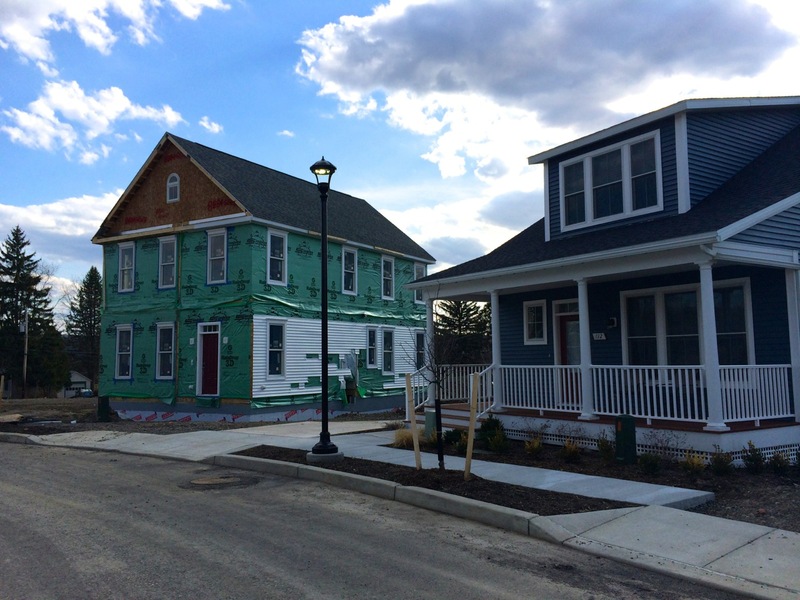 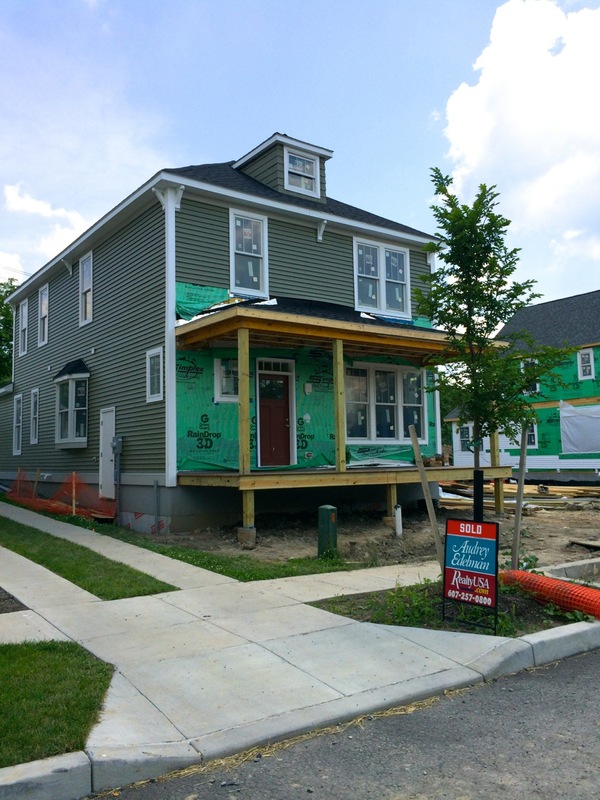 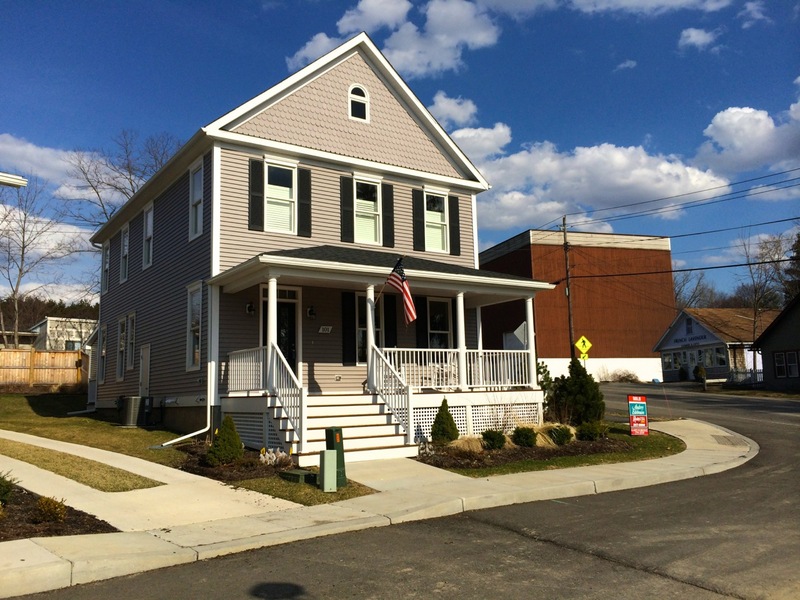 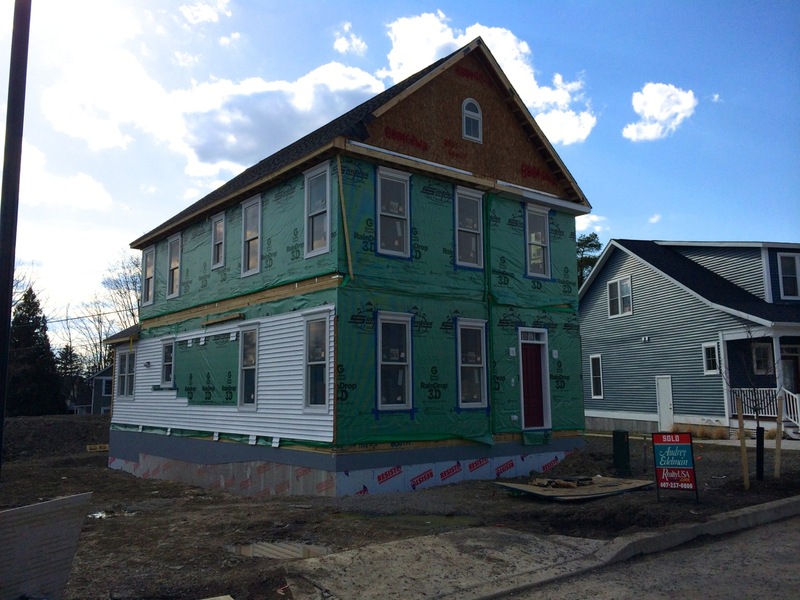 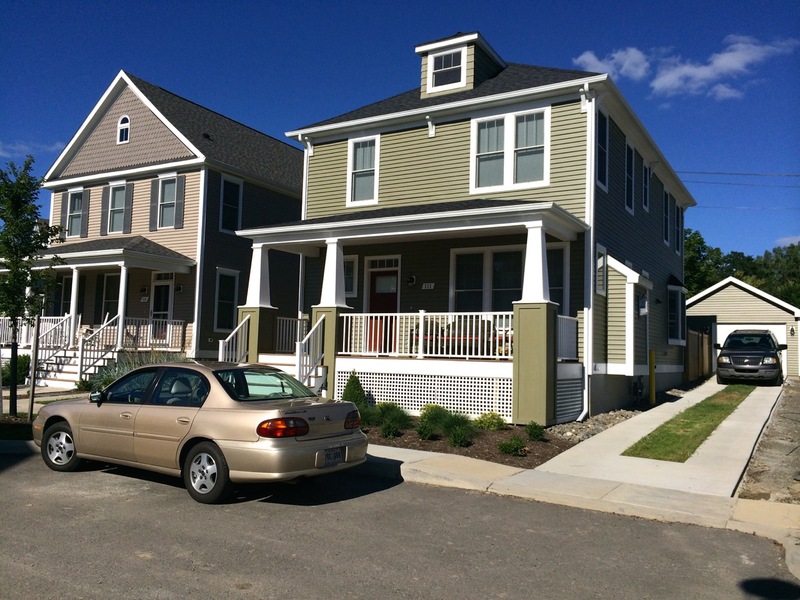 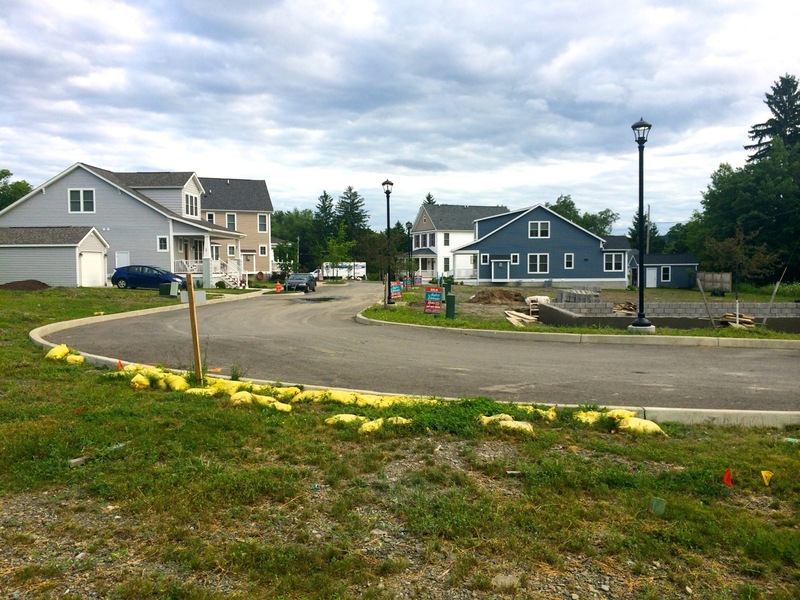 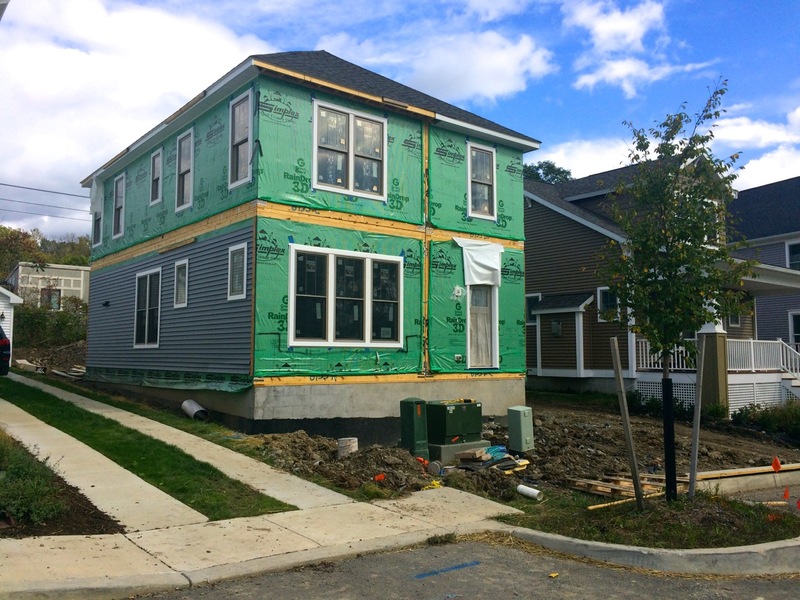 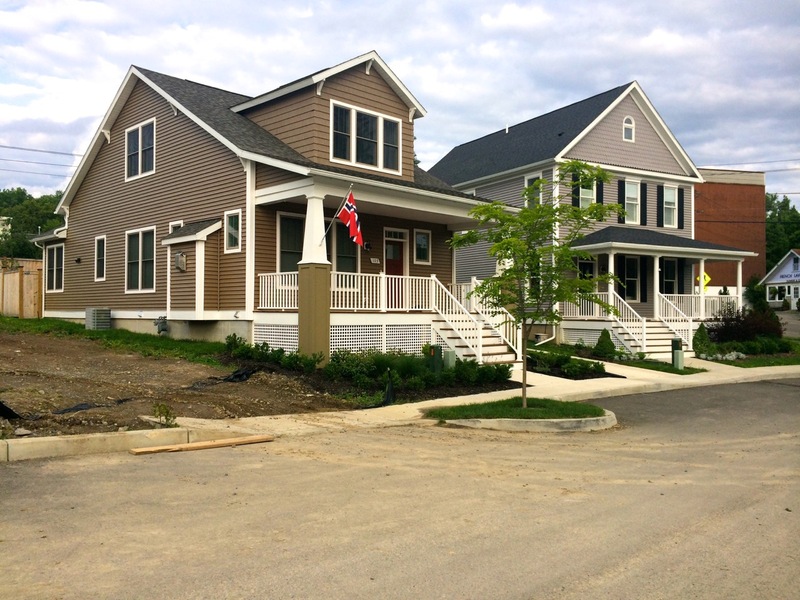 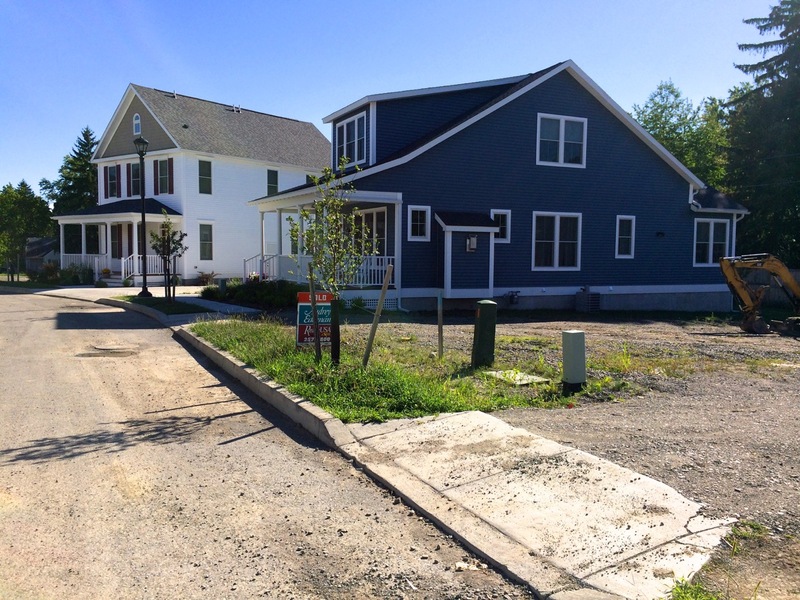 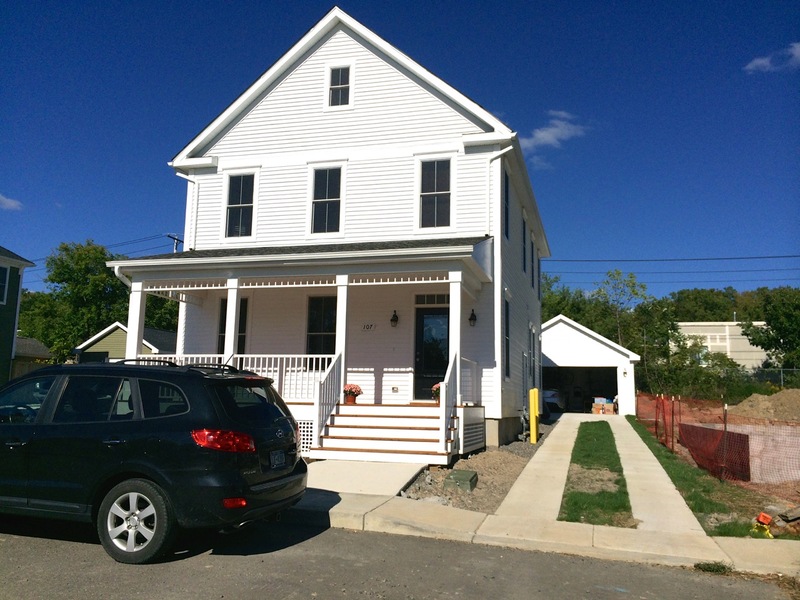 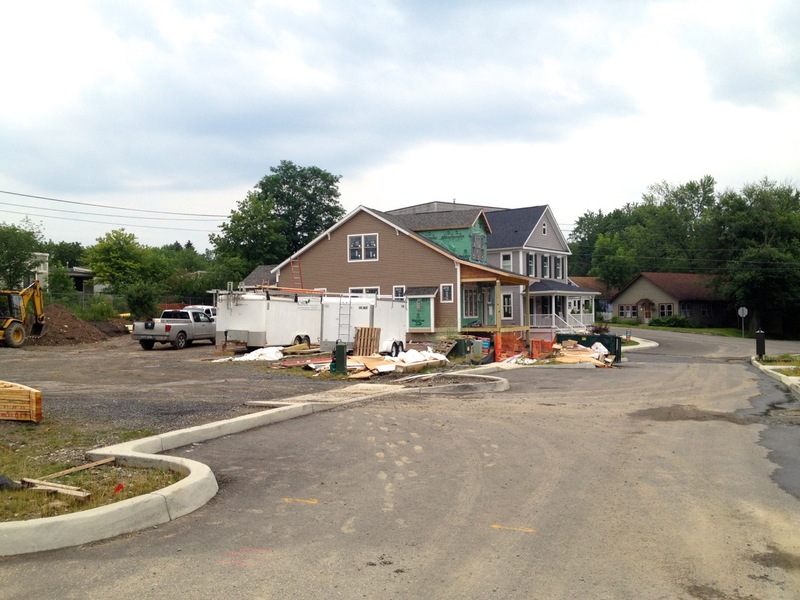 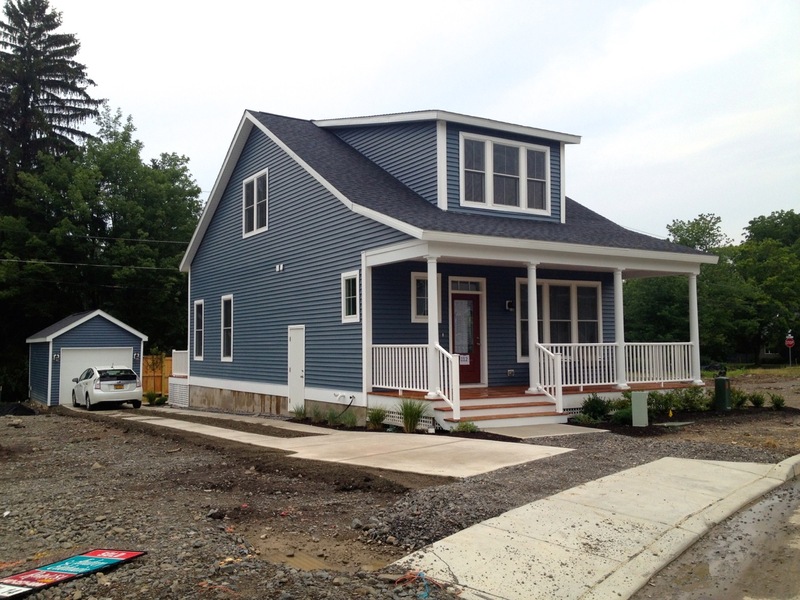 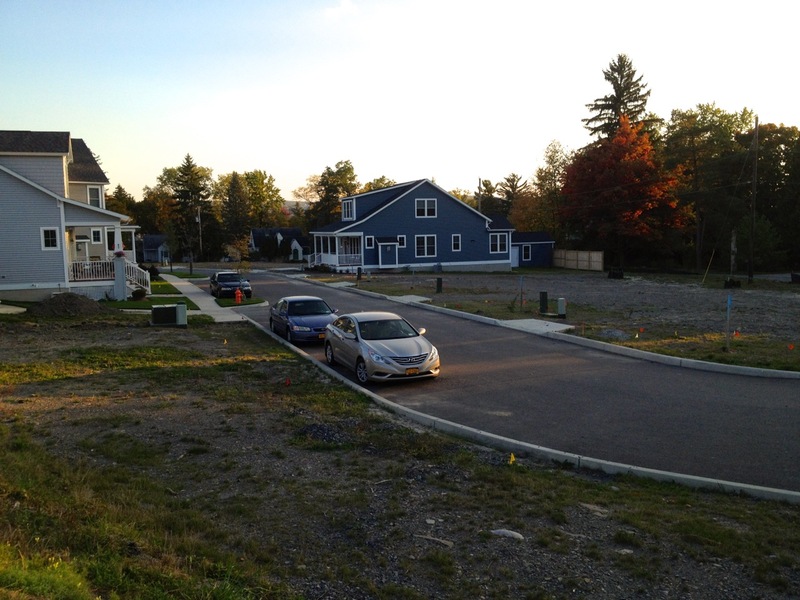 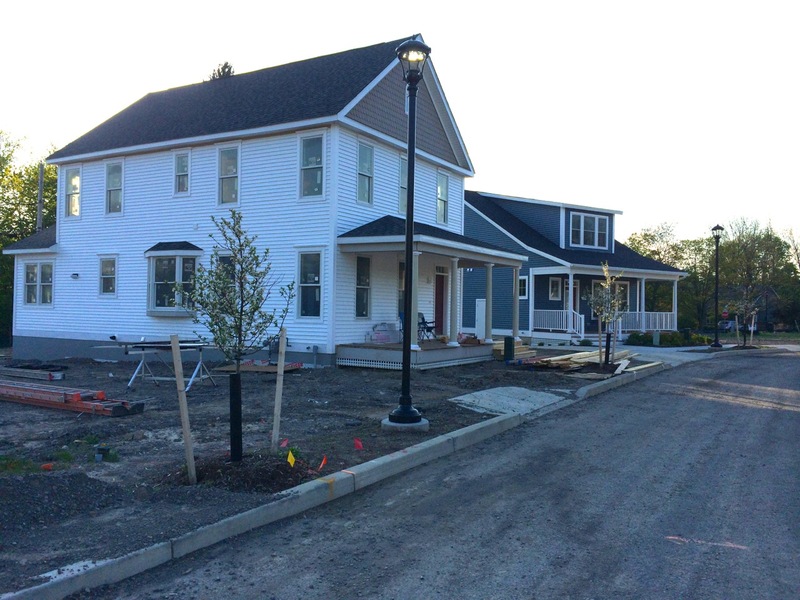 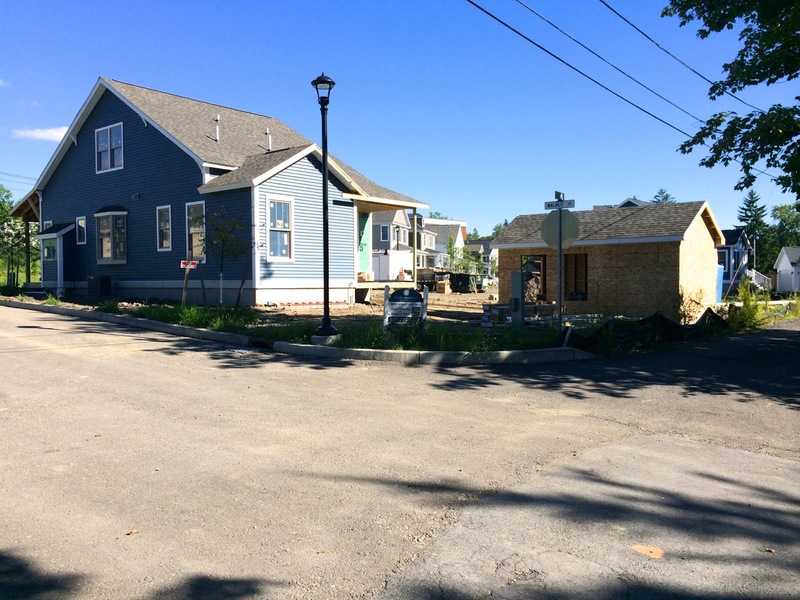 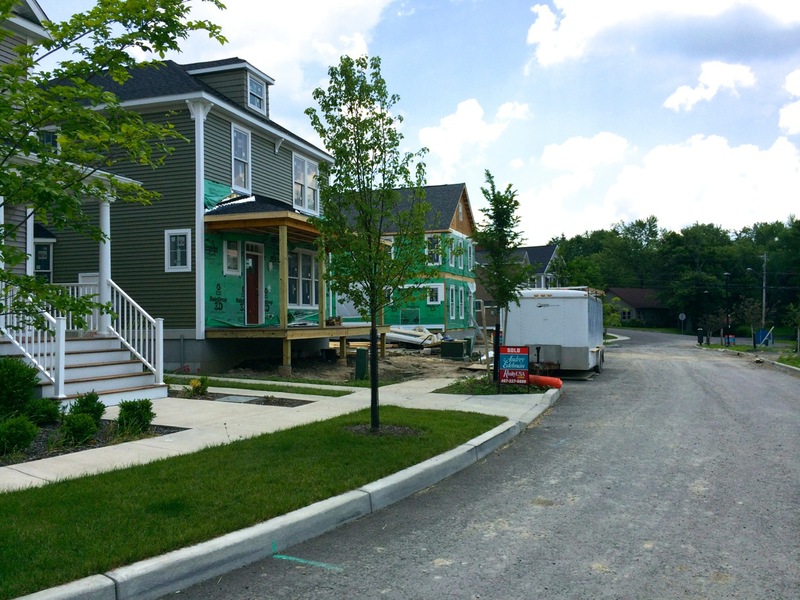 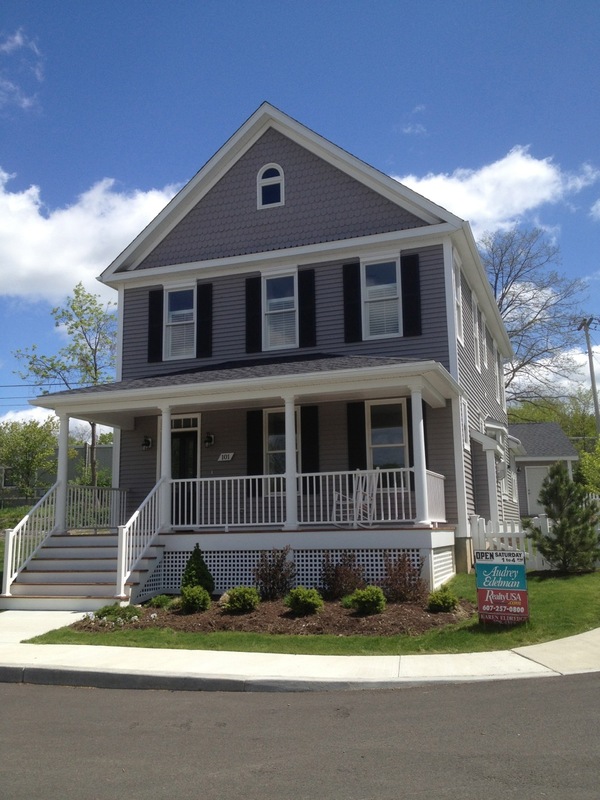 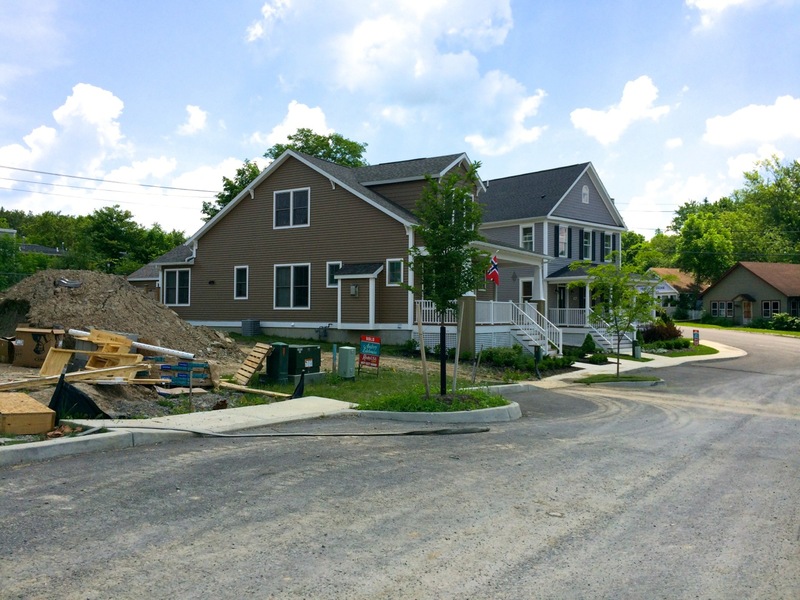 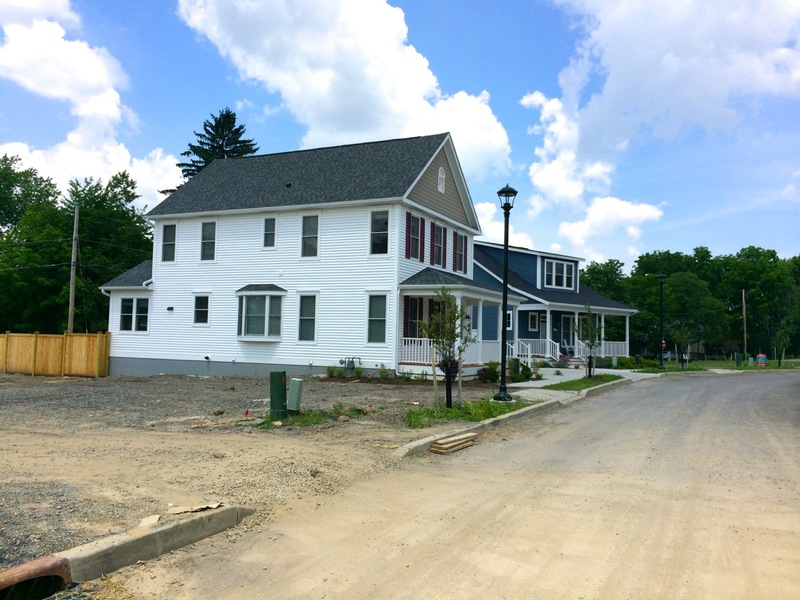 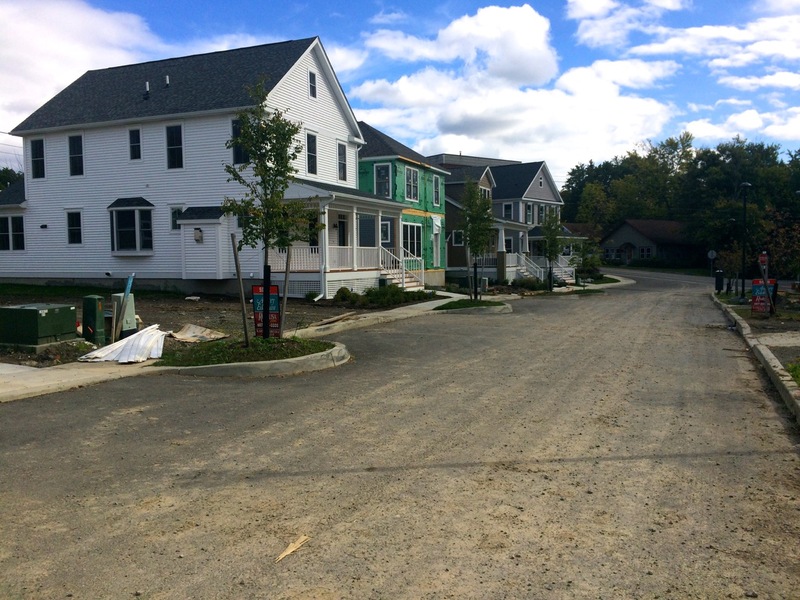 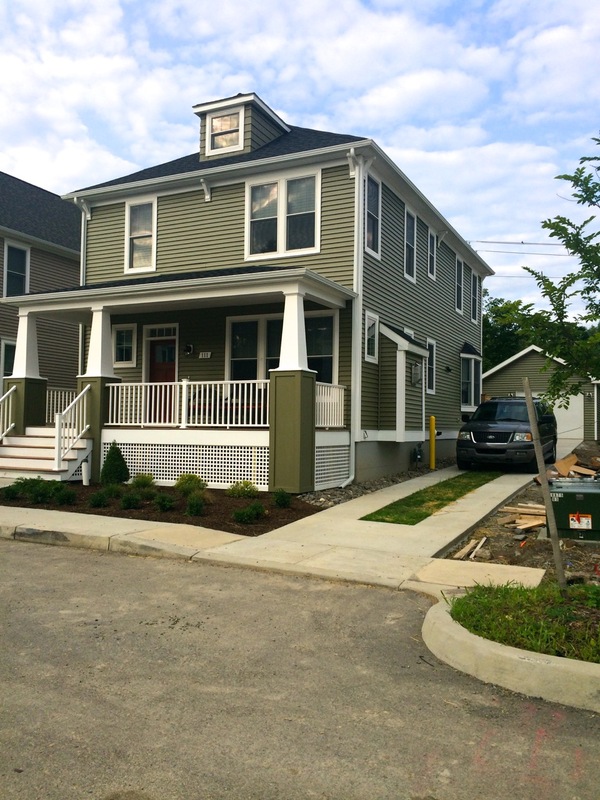 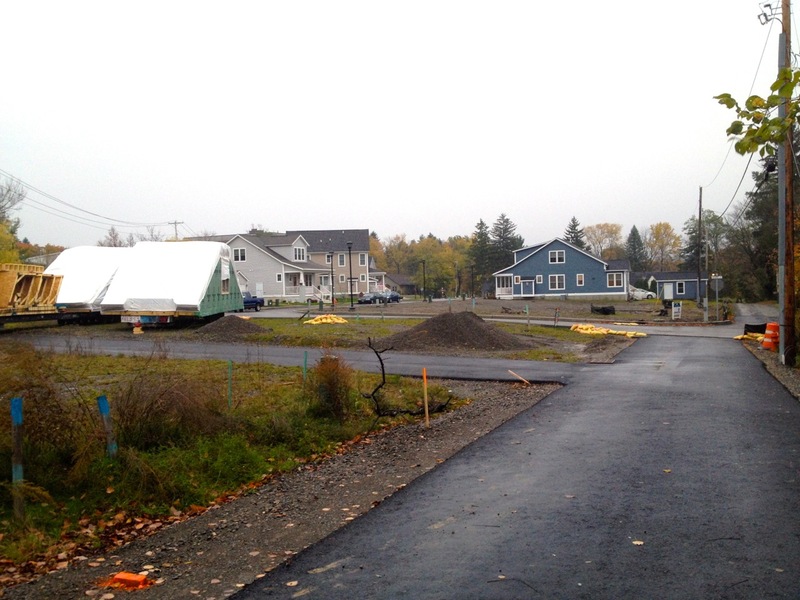 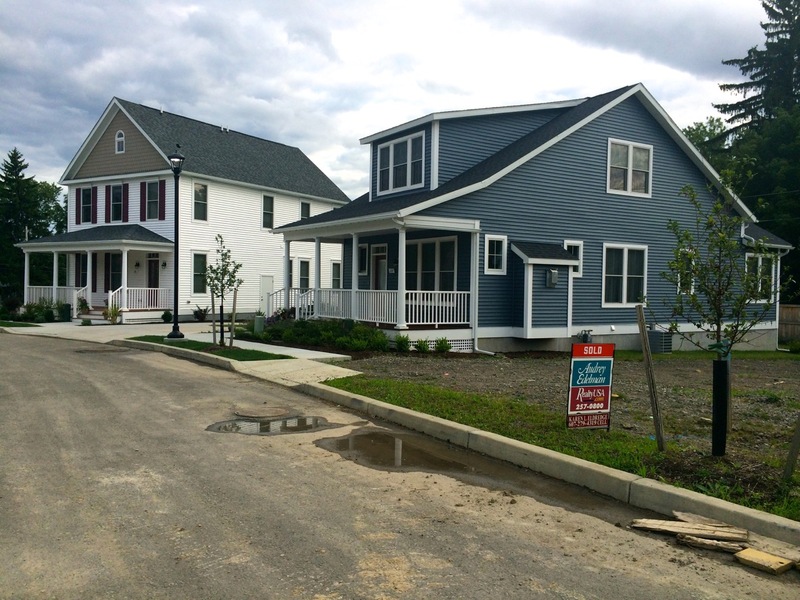 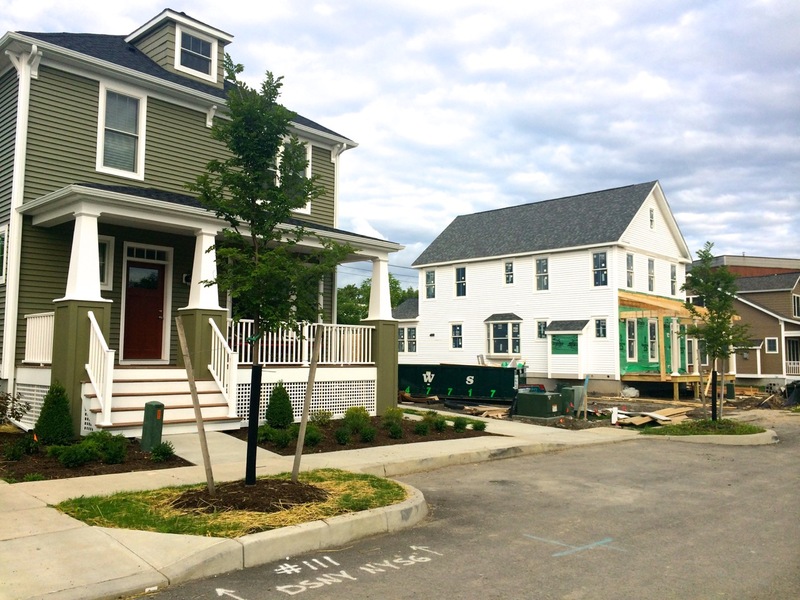 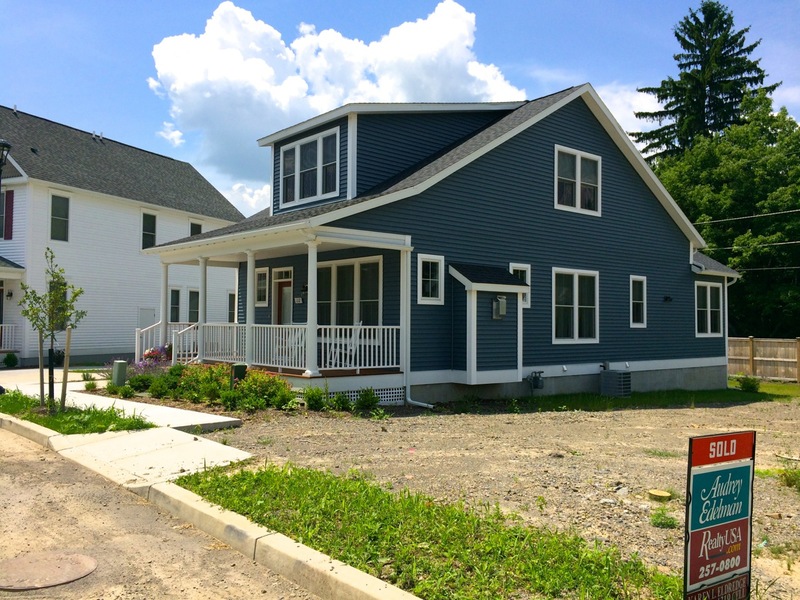 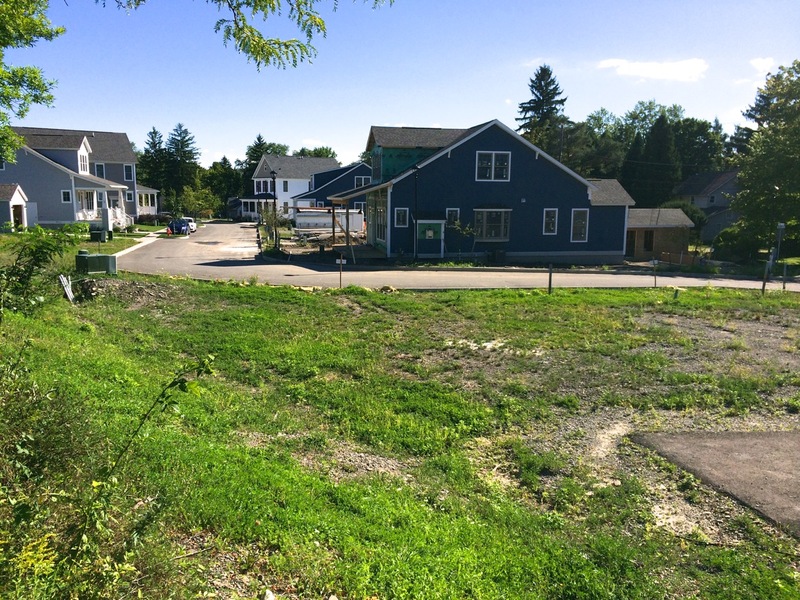 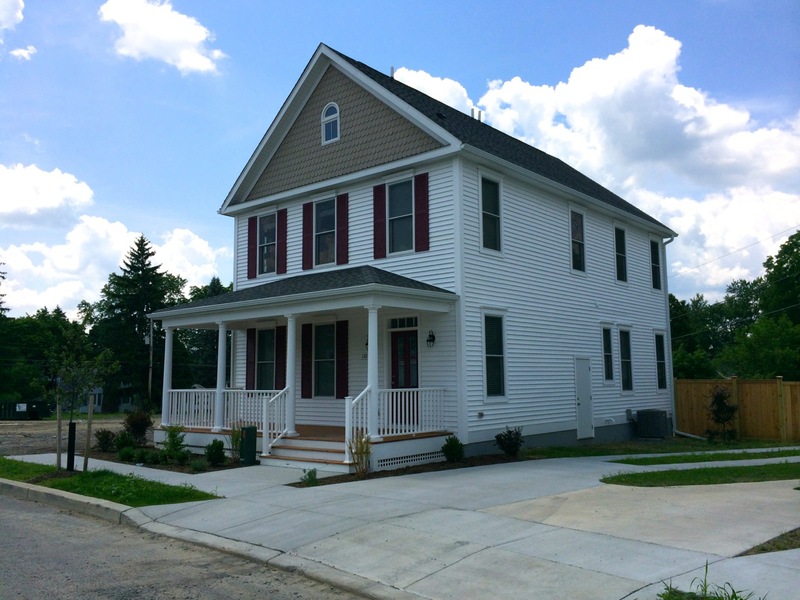 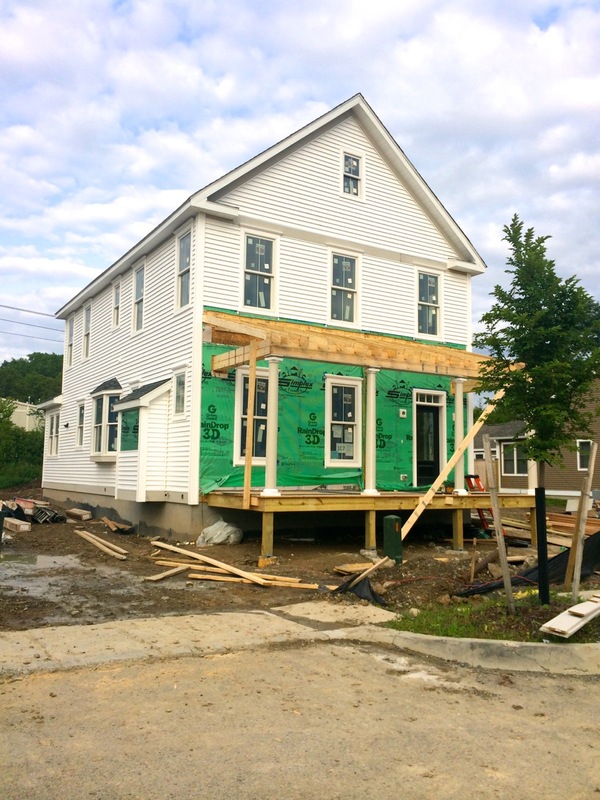 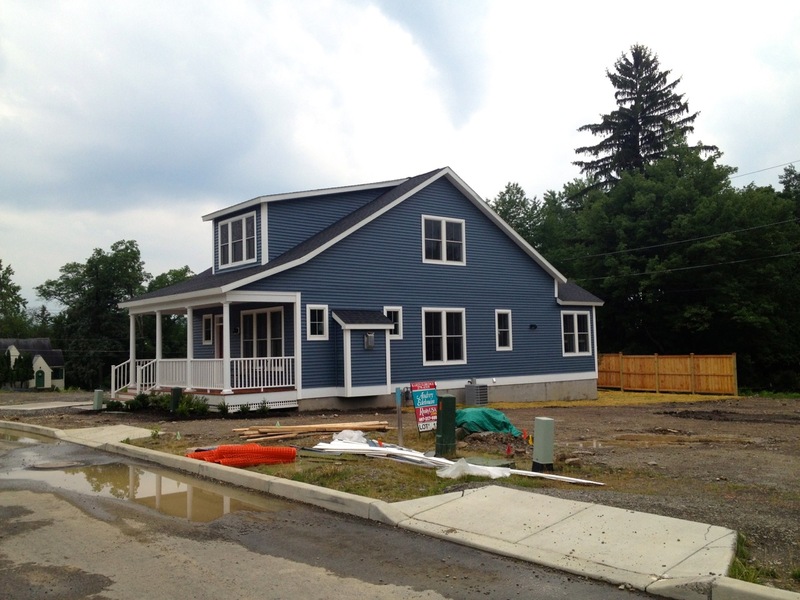 Agora Development’s Belle Sherman Cottages Lot #19 (all the way in the back) has been finished-up, along with the foundation, modular placement, interior finish work, and siding on Lot #13 (white and tan front), which sold earlier this year. 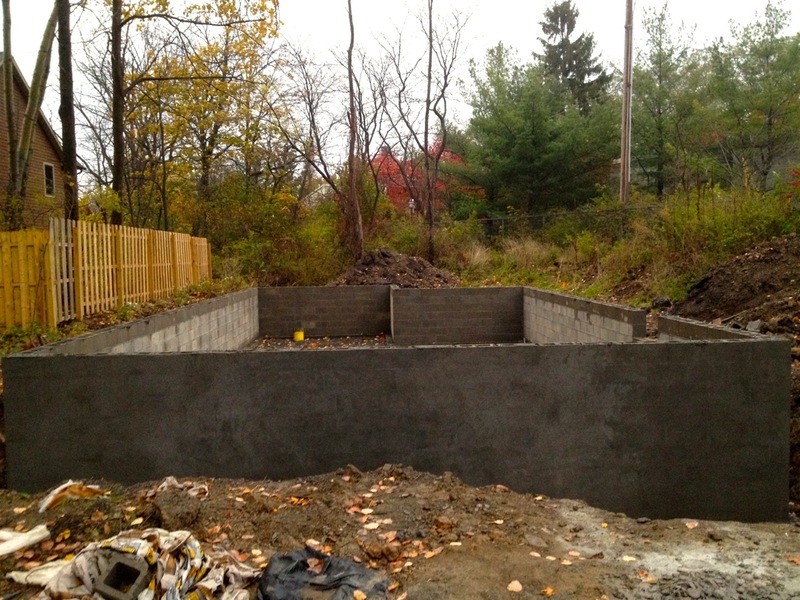 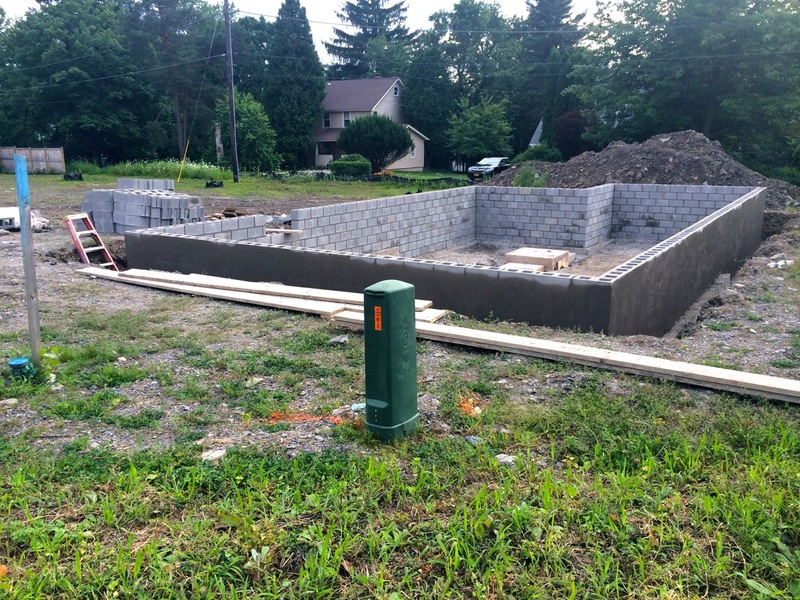 Lot #5 (Classic Bungalow Style) has also been sold, the foundation dug, footers poured, and Insulated Concrete Form blocks have been assembled for pouring concrete inside to form the foundation walls. 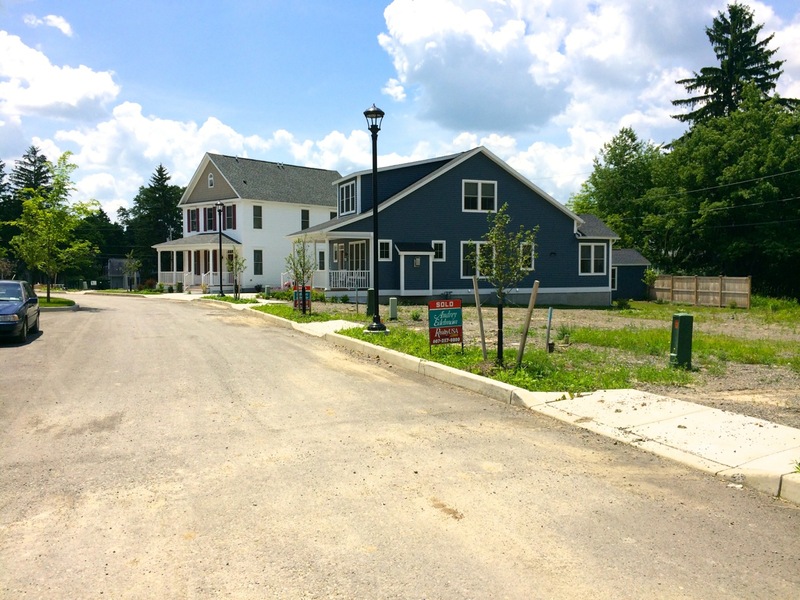 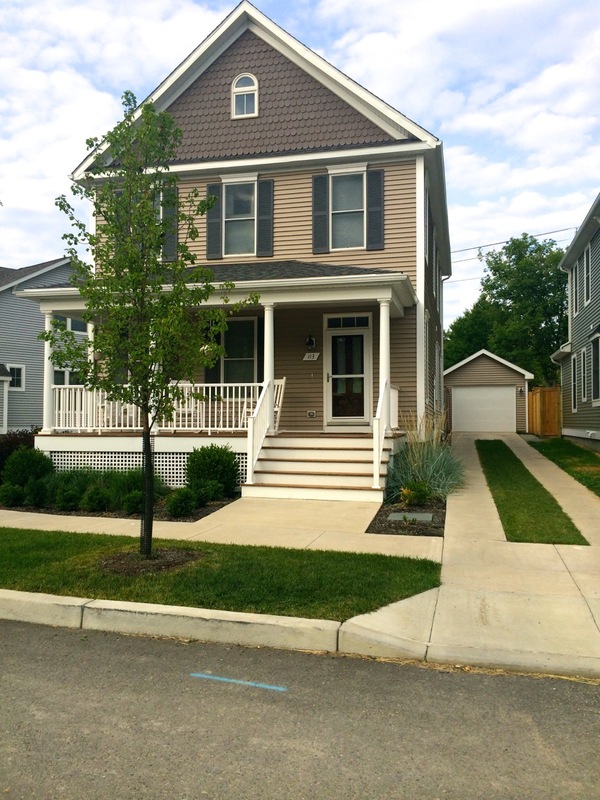 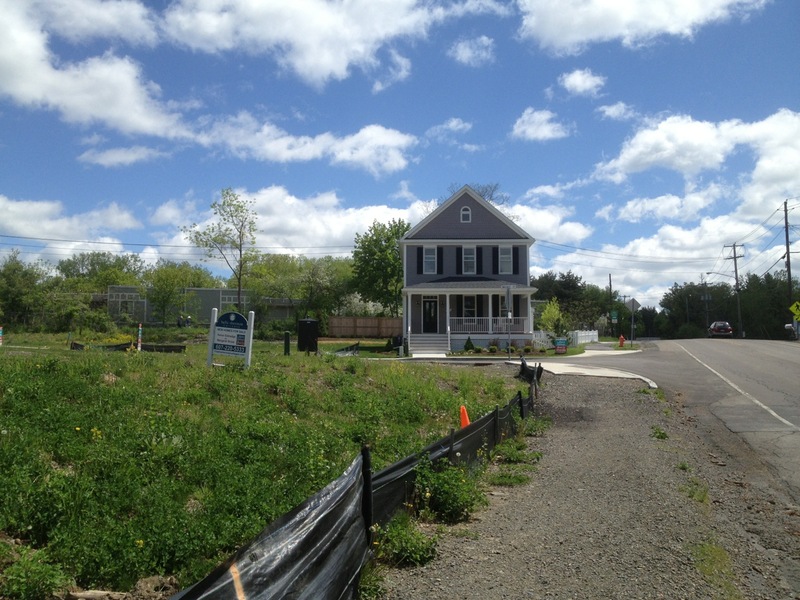 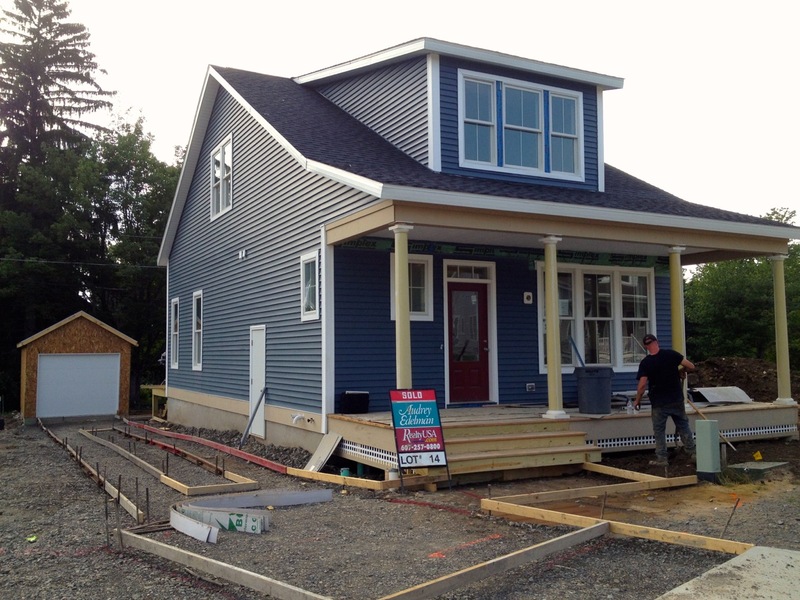 Lot #3 has also sold, which will be a Craftsman Farmhouse-style home. 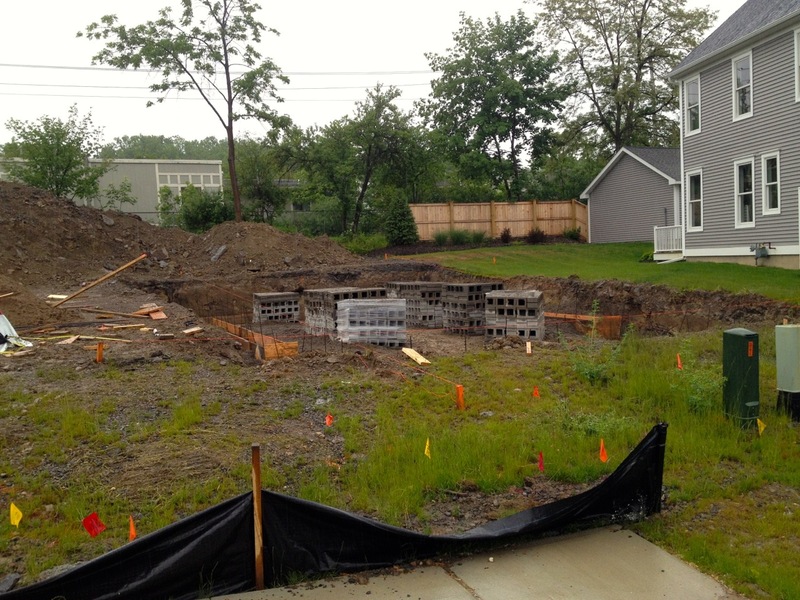 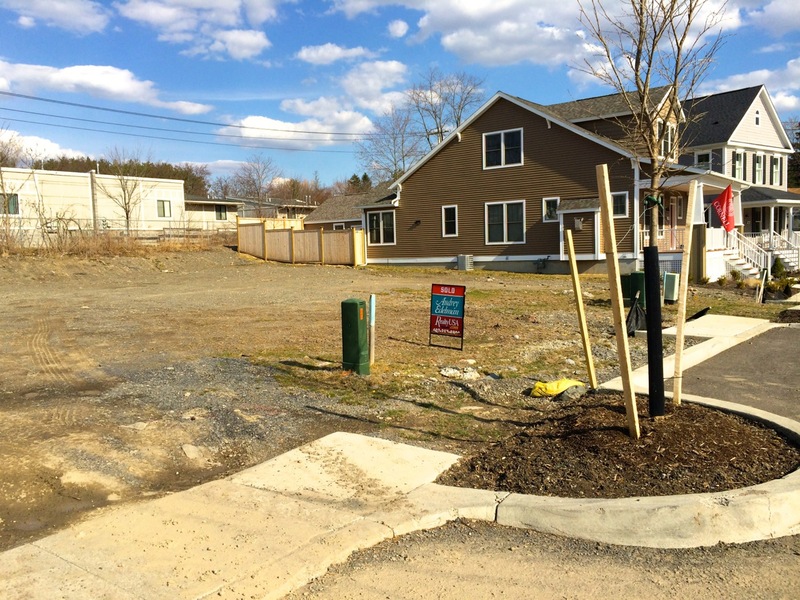 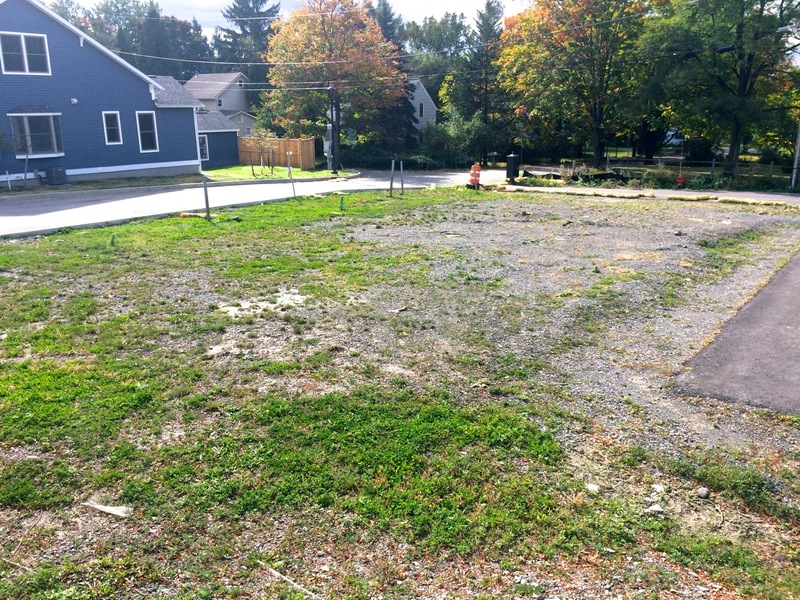 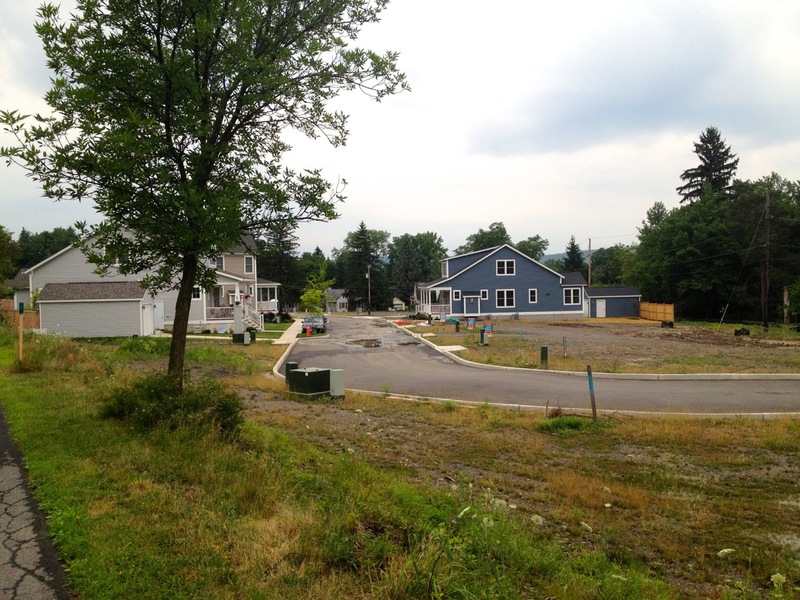 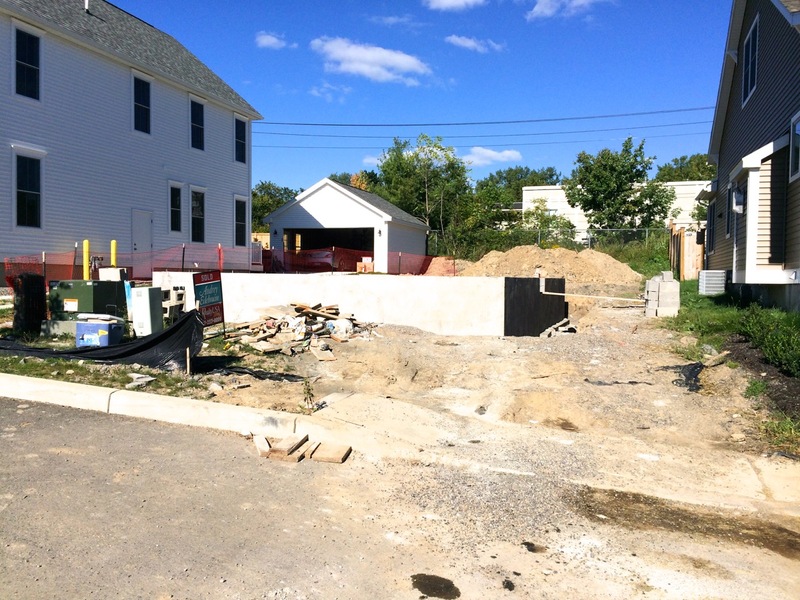 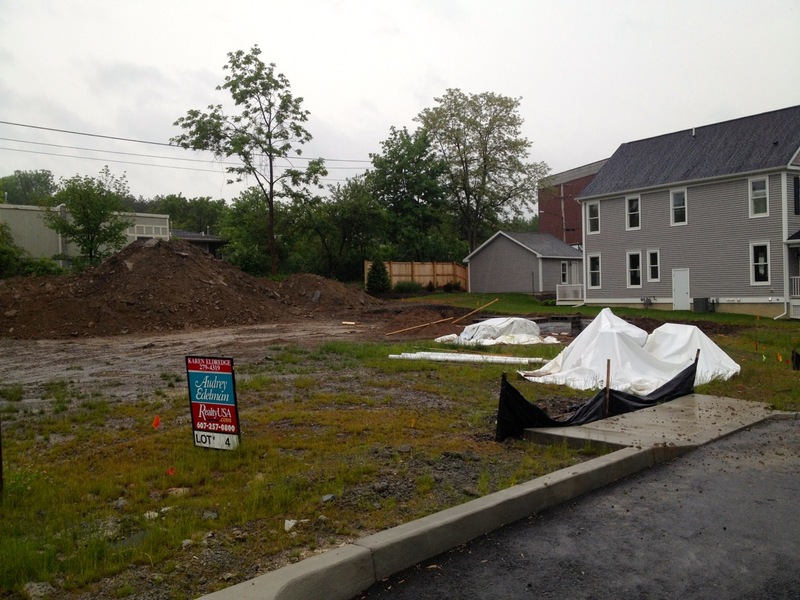 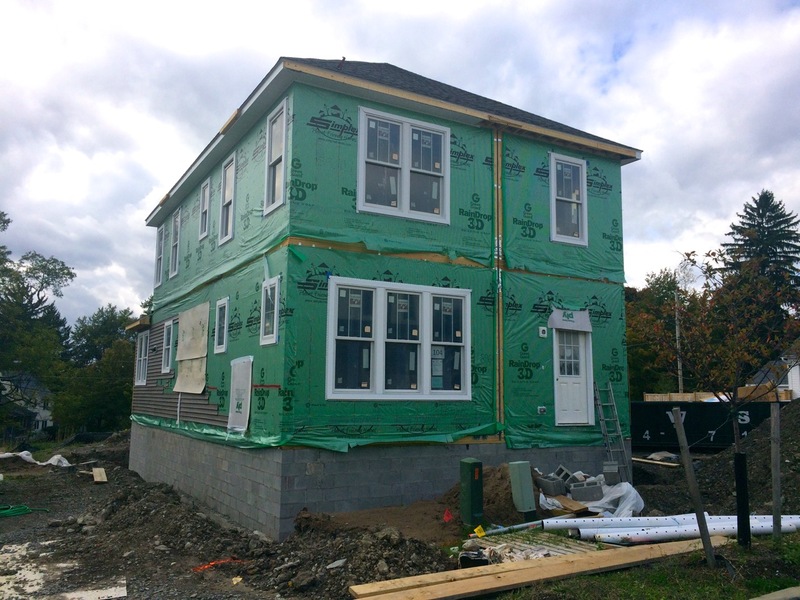 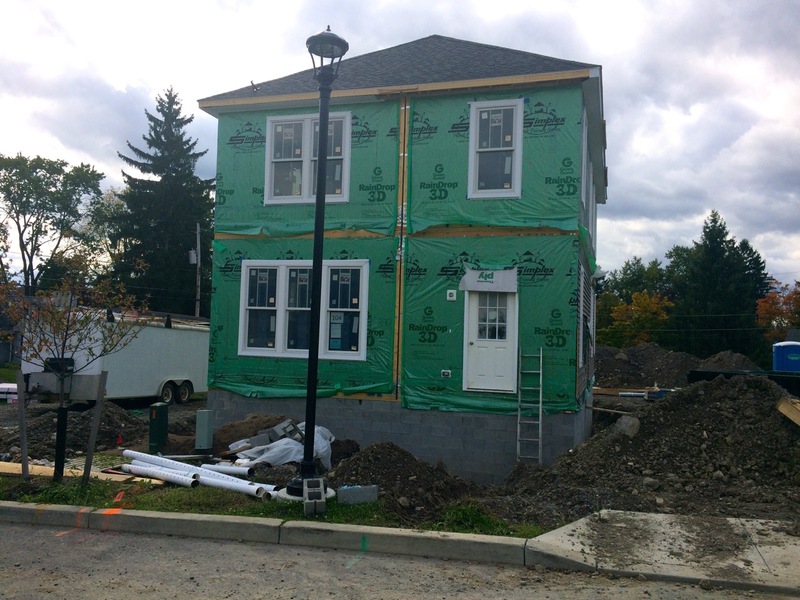 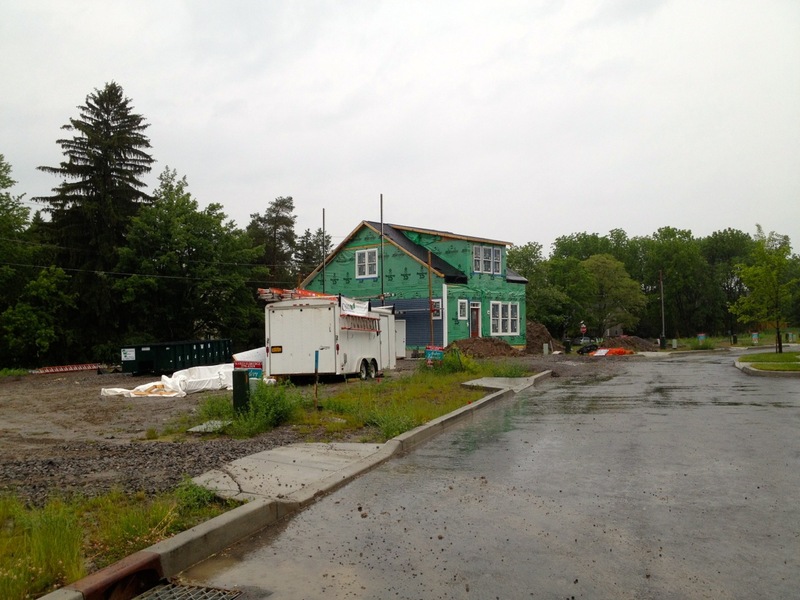 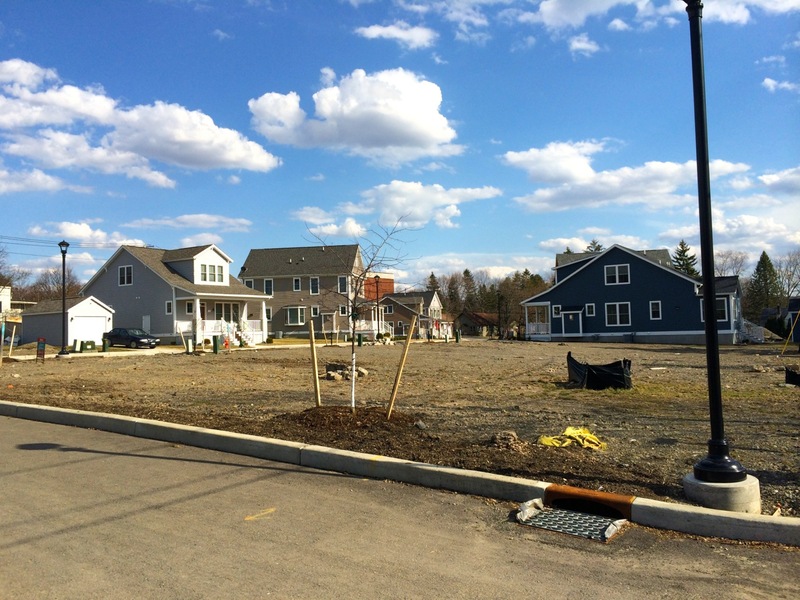 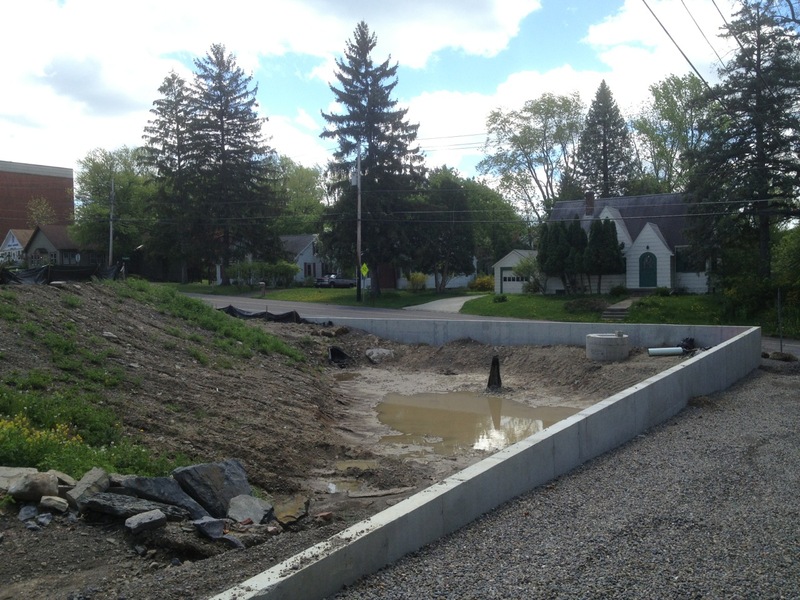 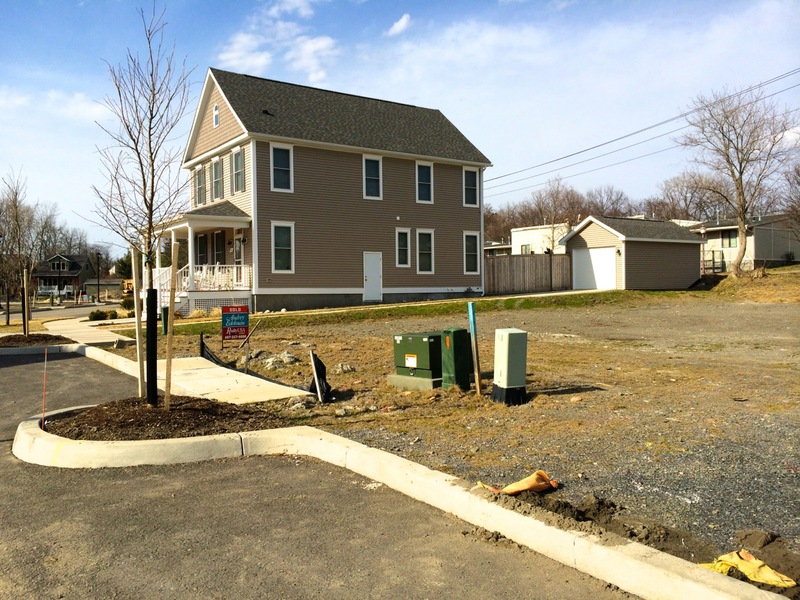 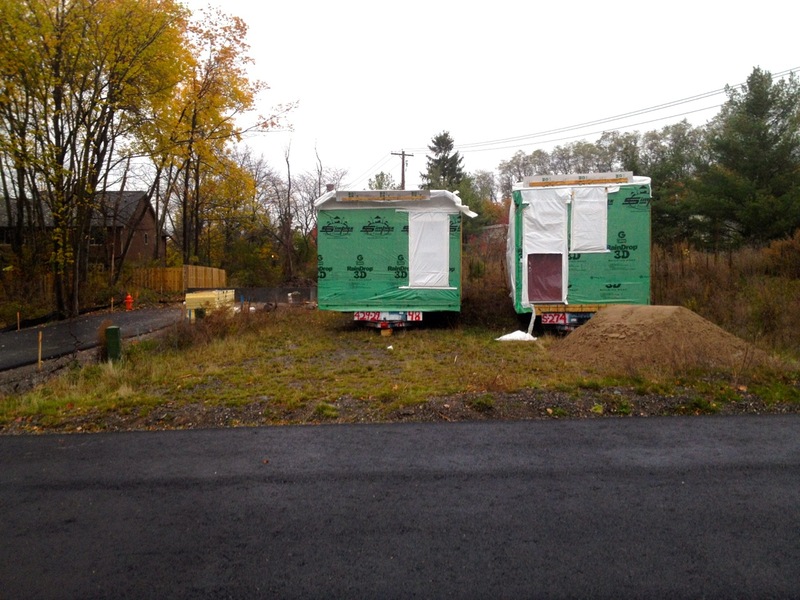 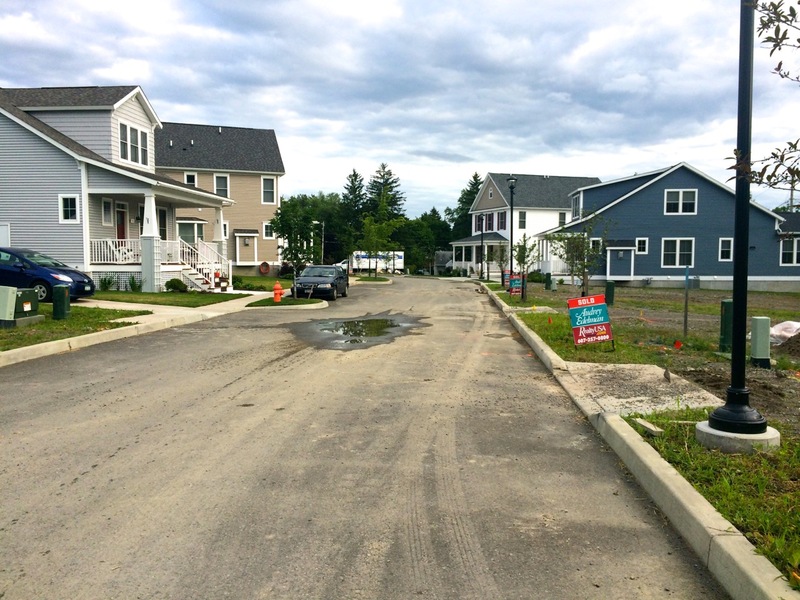 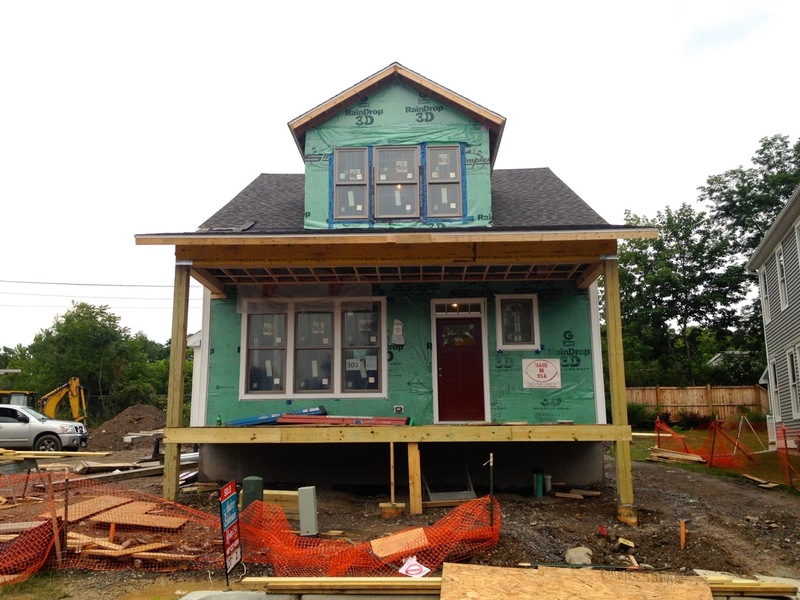 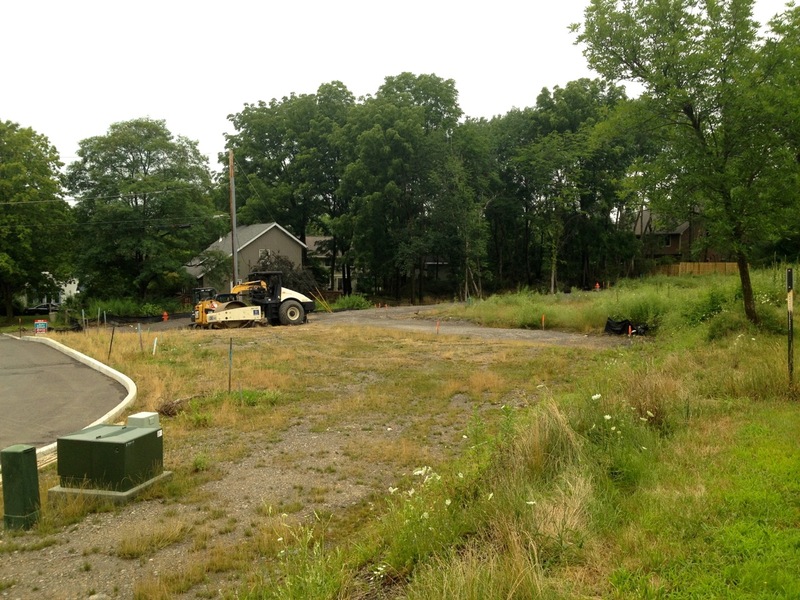 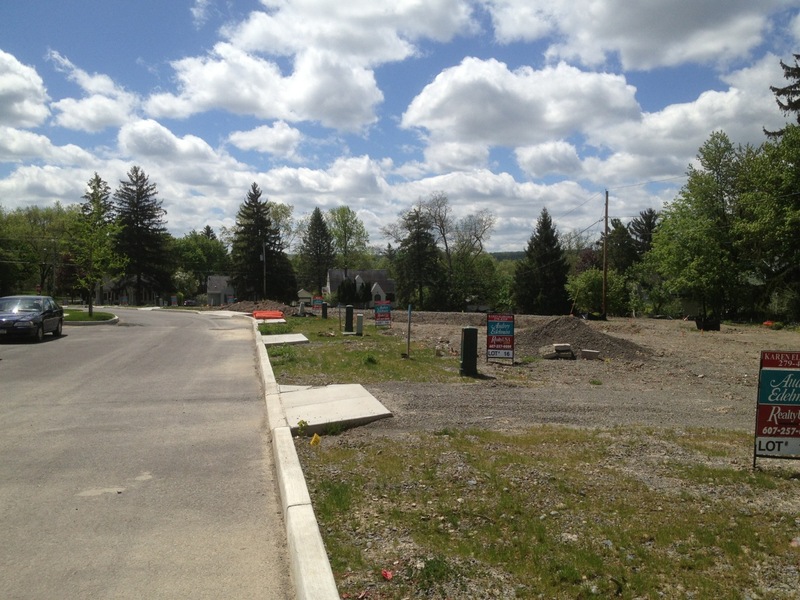 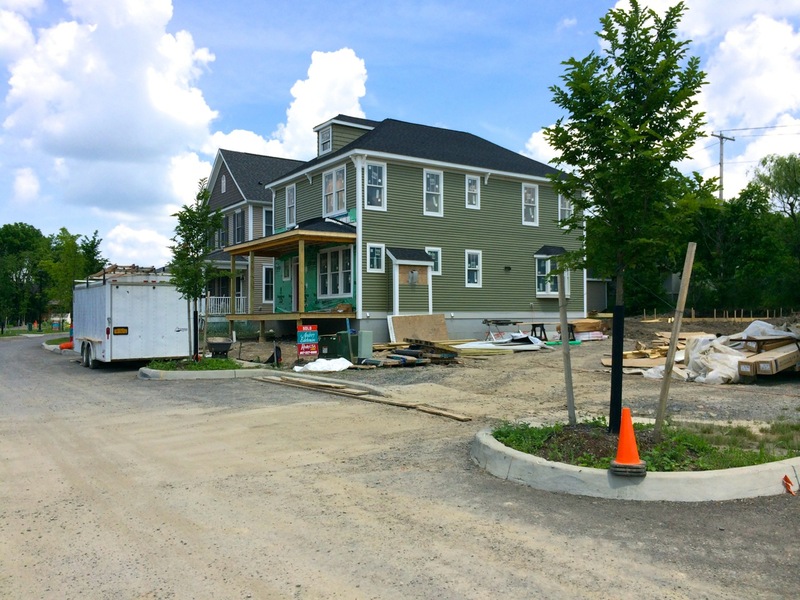 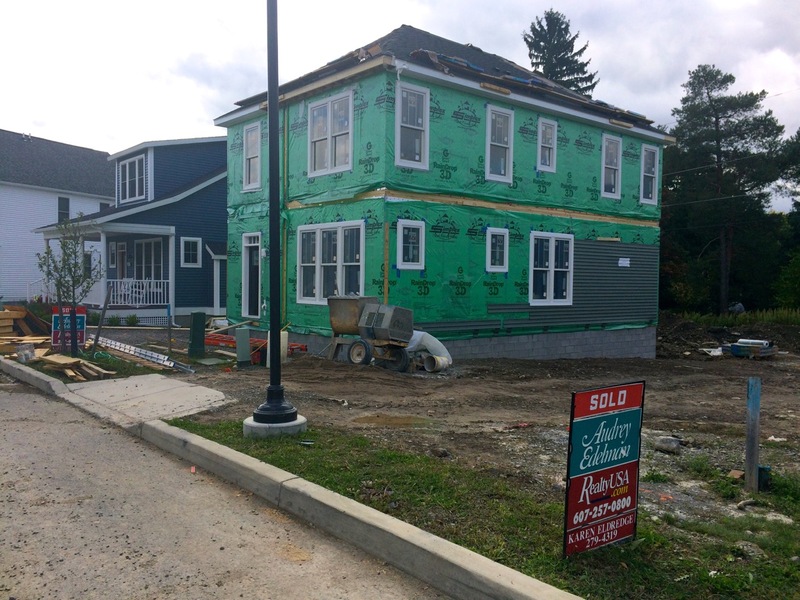 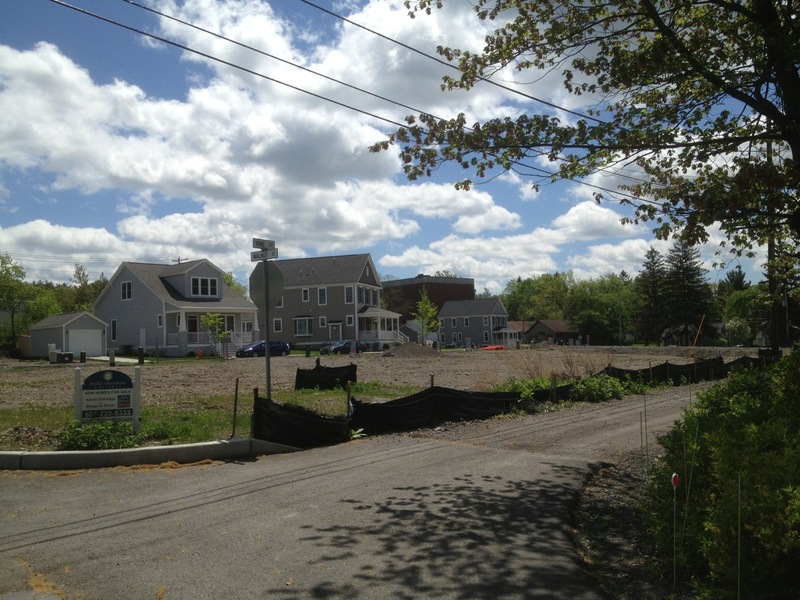 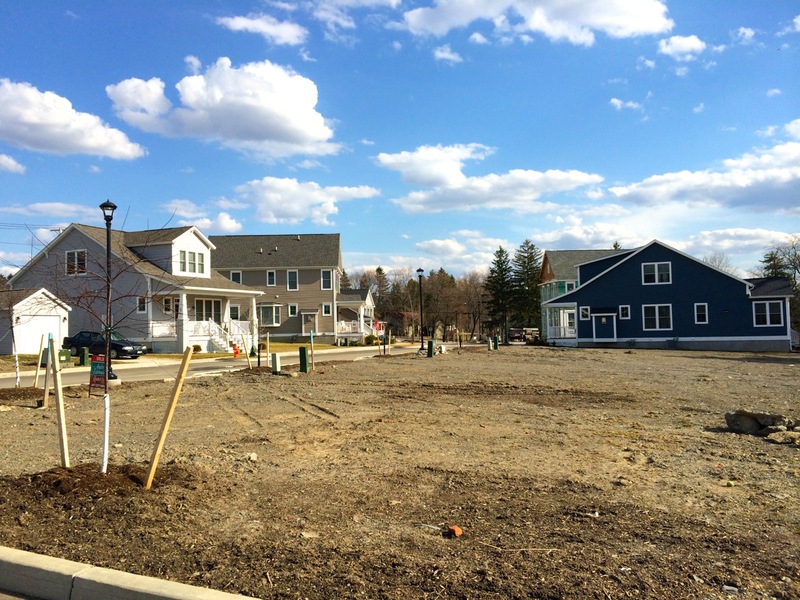 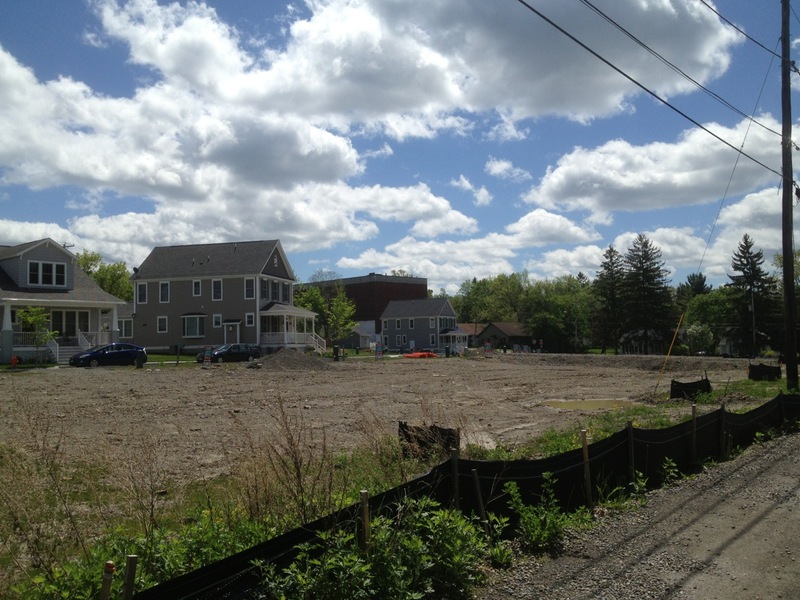 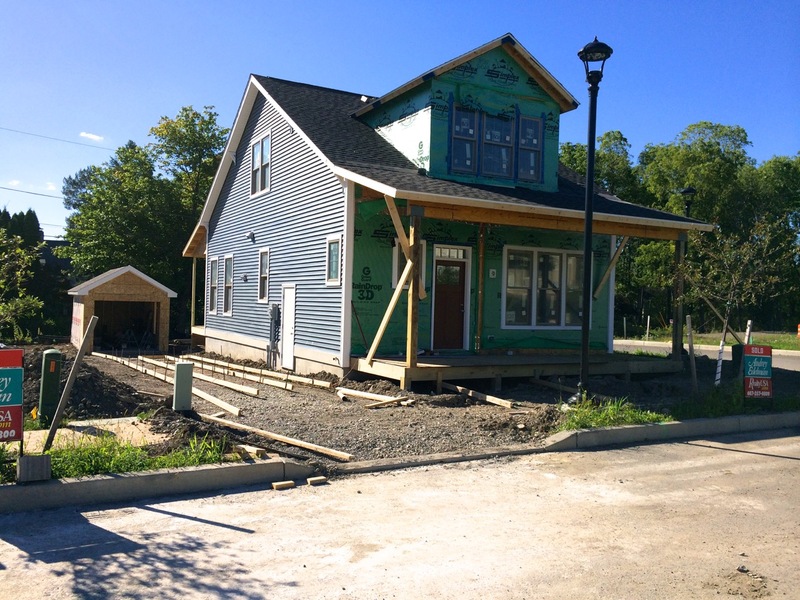 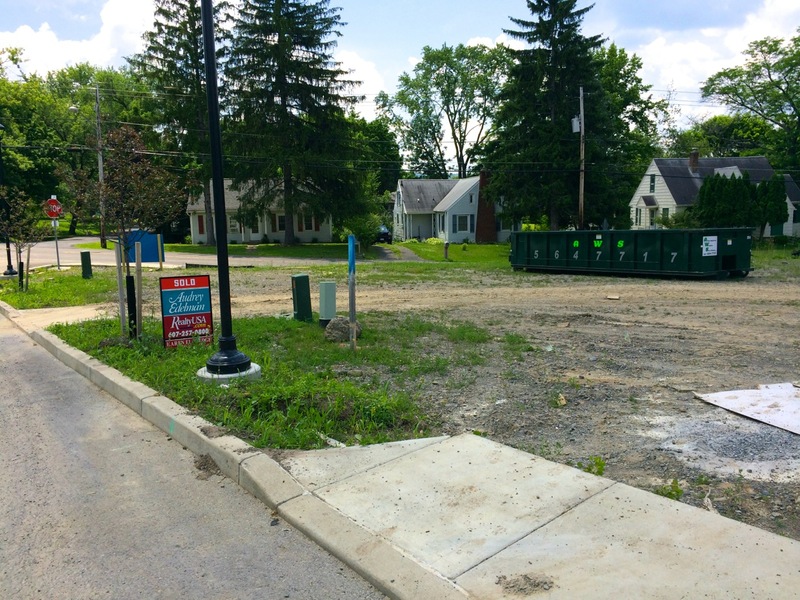 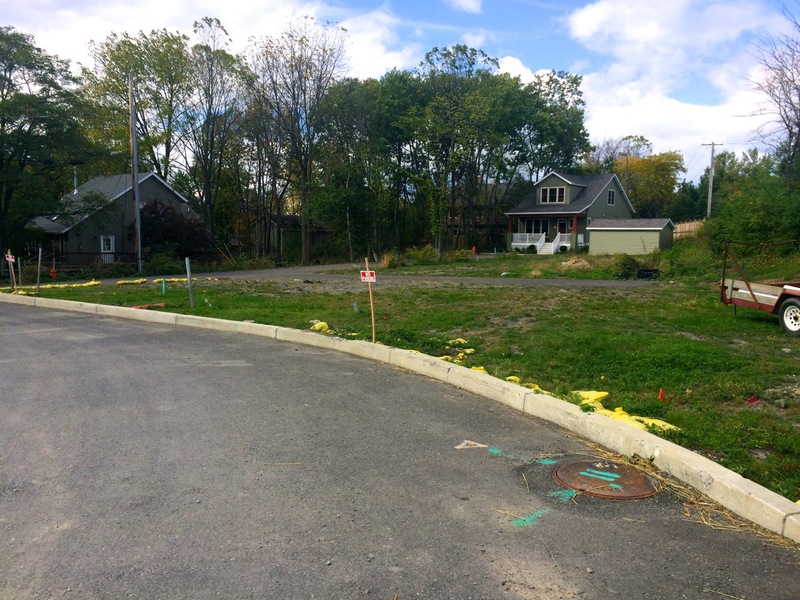 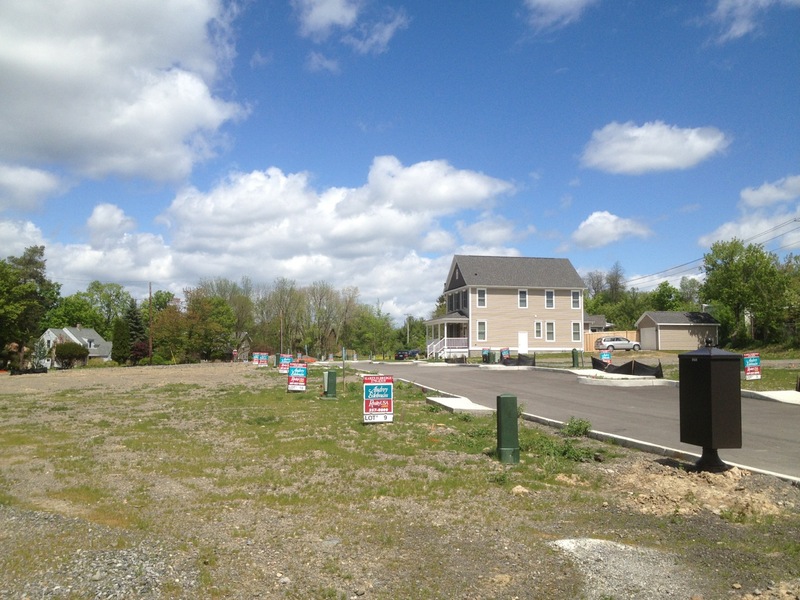 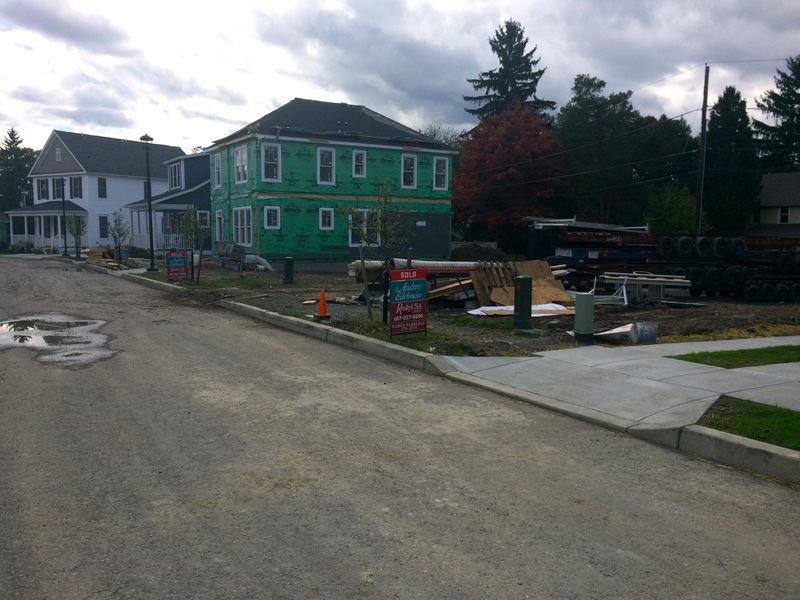 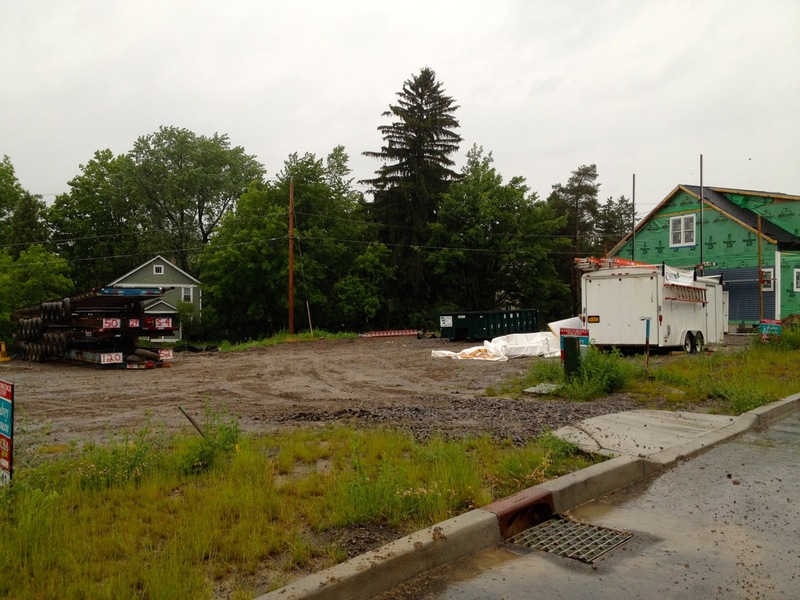 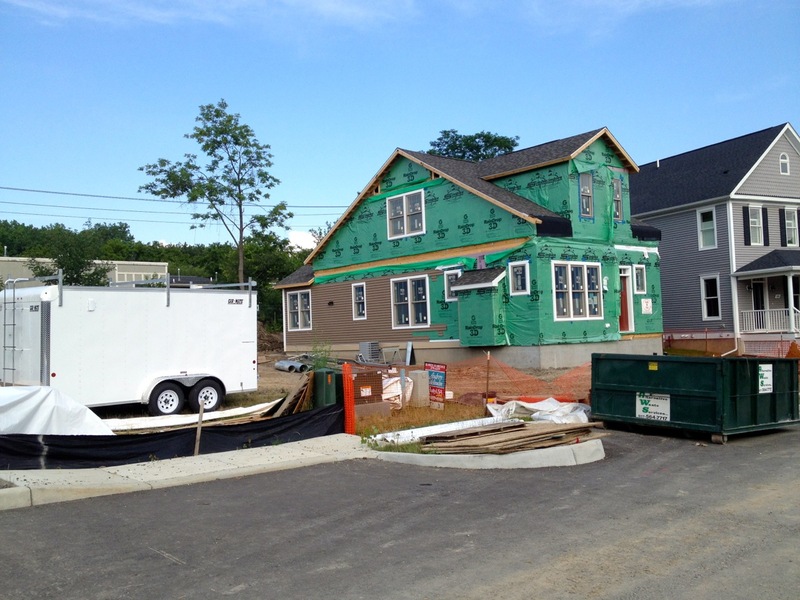 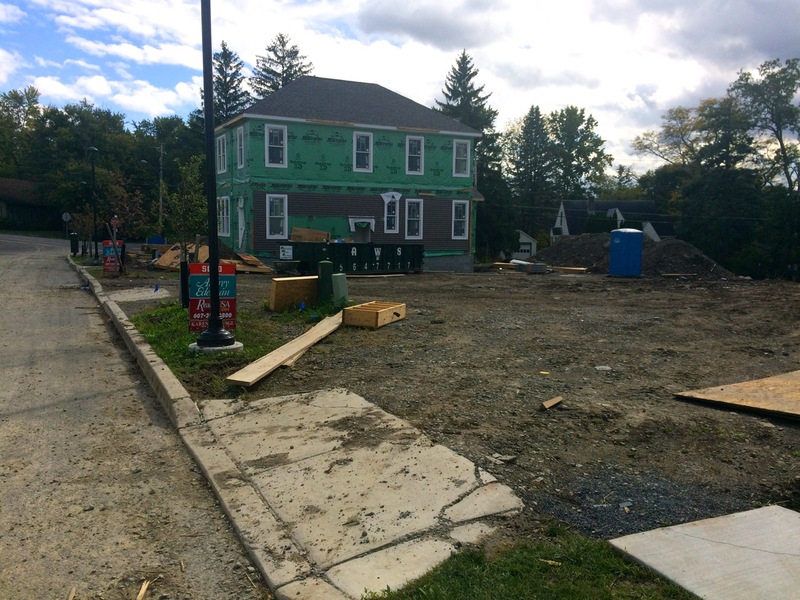 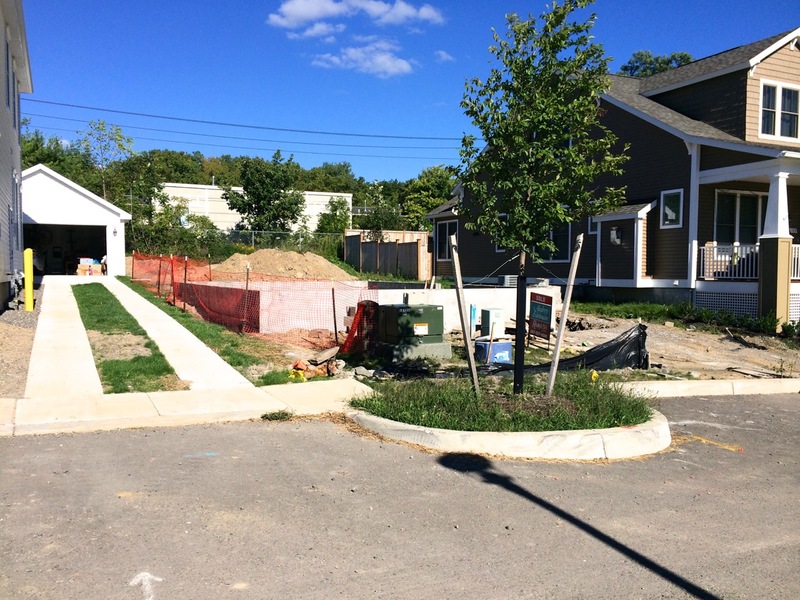 Agora Development’s Belle Sherman Cottages Lot #19 (sold back in June) has a fully dug and set foundation, and the four modular pieces from Simplex Homes in Scranton, PA are on site. 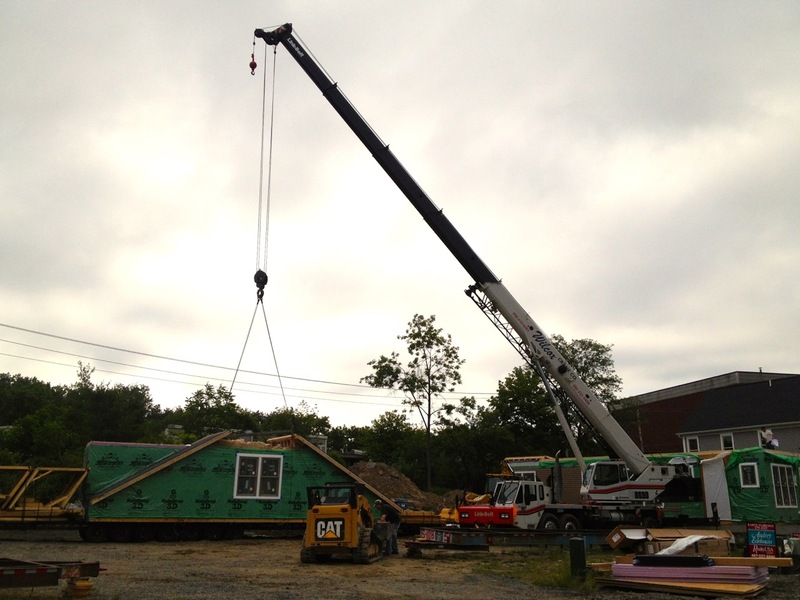 The first two pieces are carefully hoisted onto the foundation by crane, levelled and secured, then the next two are hoisted and set in place. 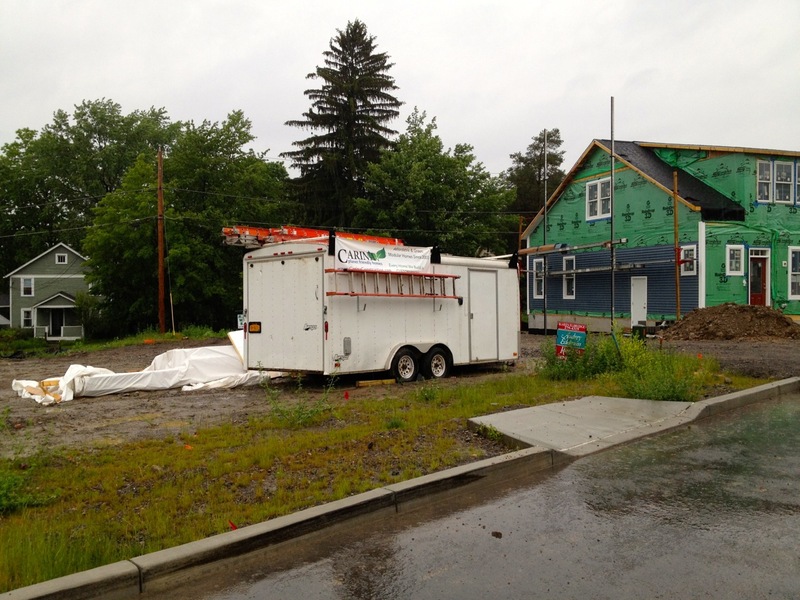 The adjoining walls and ceilings are secured with steel plates and create a double-sized cavity space (which is actually quite advantageous for sound suppression), and I was very surprised at how non-modular the interiors were from a tour back in the Summer- the build quality is also superb. 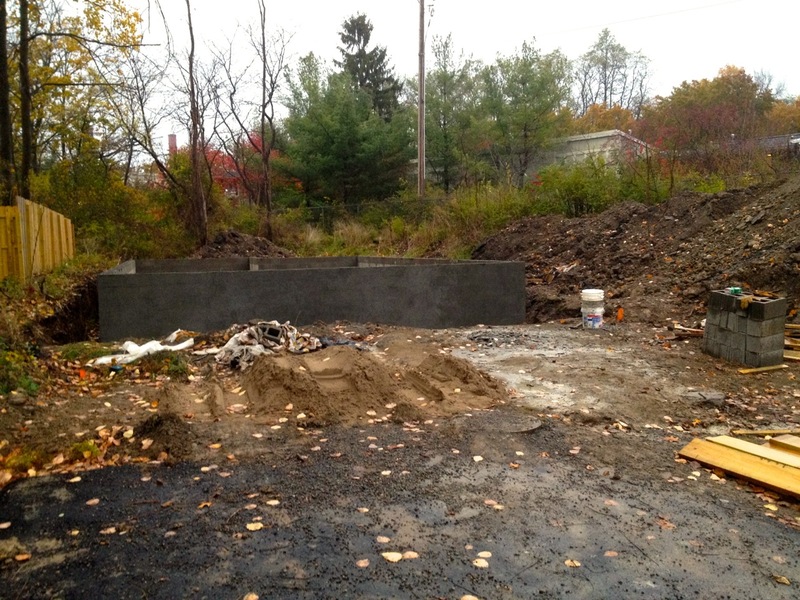 Carina Construction will probably be putting this up in short time. 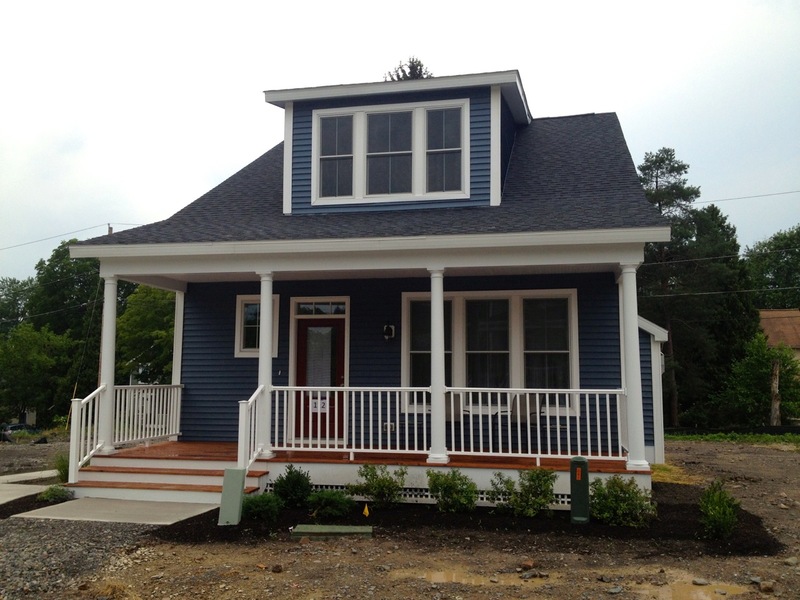 I haven’t been up here since July, but the Craftsman-style house on Lot #2 has been completely finished. 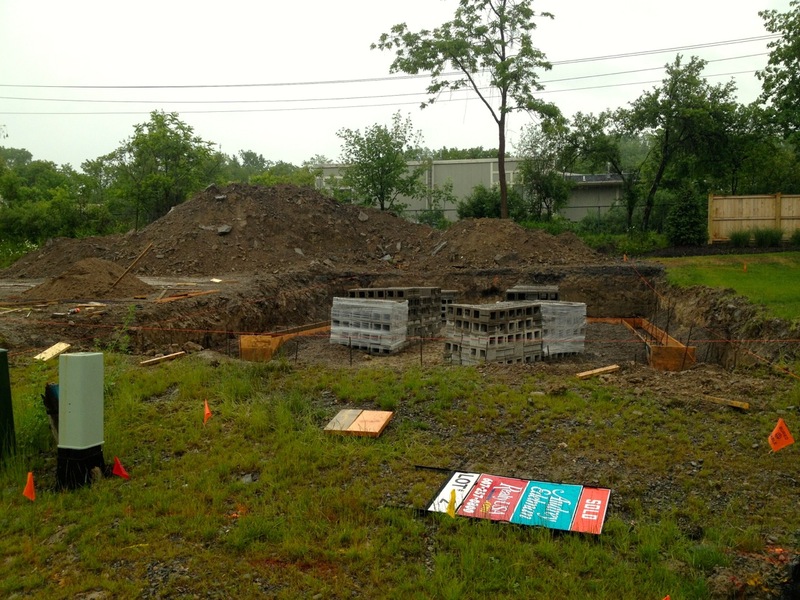 Lot #19 has been marked-out (the lot all the way in the back/far north of the site), but there’s no sign of digging for a foundation yet. 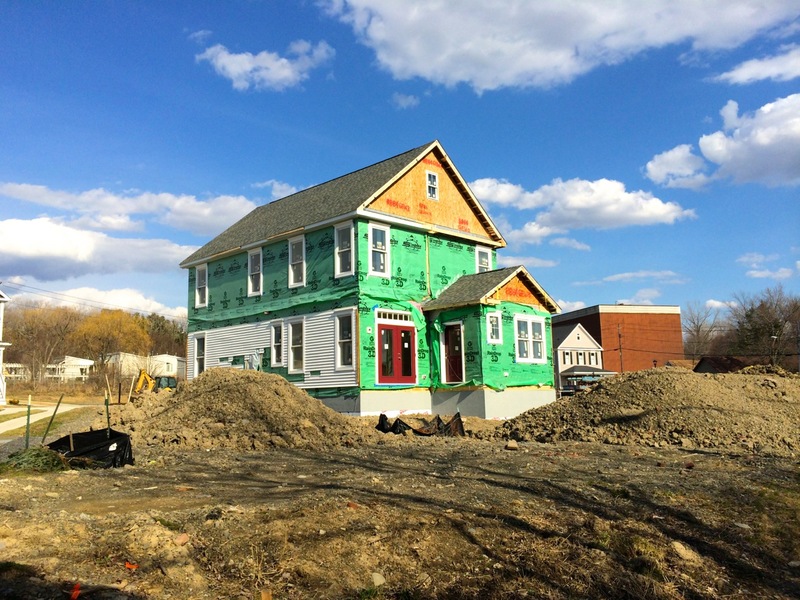 After enough houses sell, we’ll probably see the townhouses built, but now that the real estate market is calming down for the approaching winter, it may not be until sometime next year. 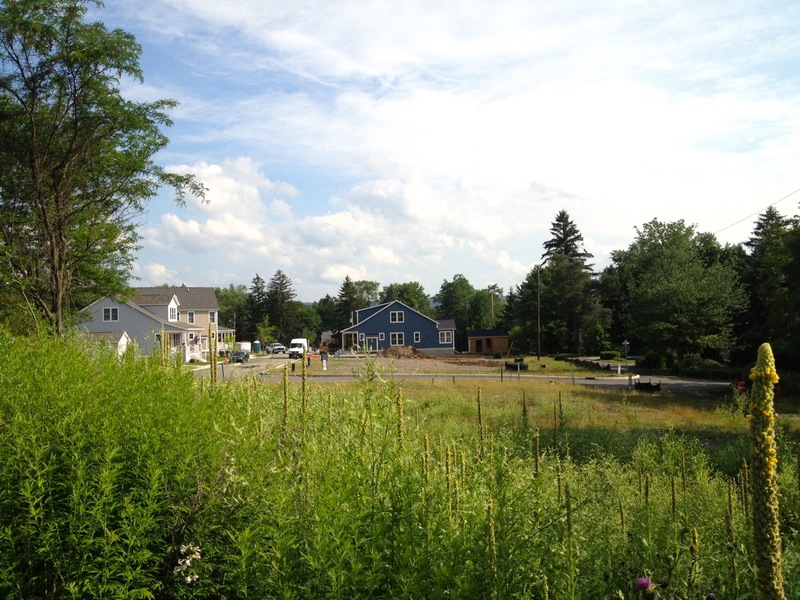 Ithacating’s last update contains some nice shots from late July as well. 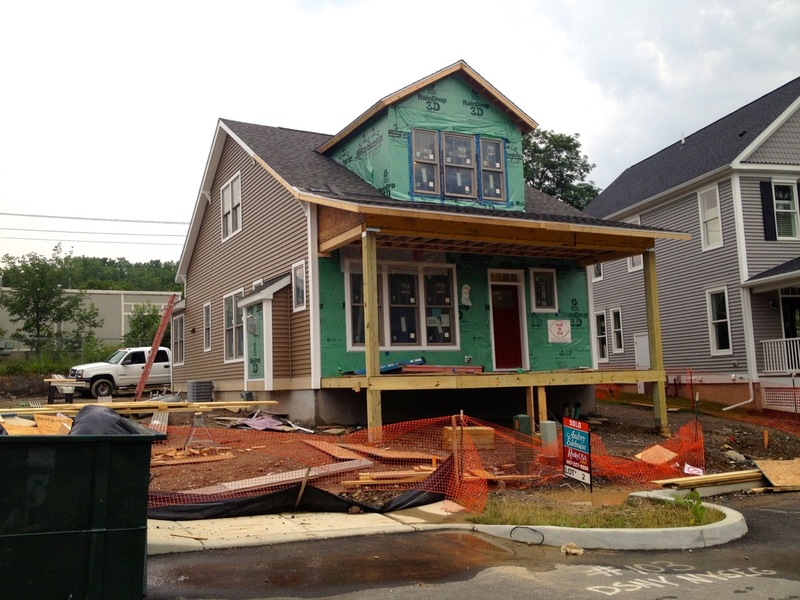 Lot #14 (Number 112) is all done and Lot #2 is coming along. 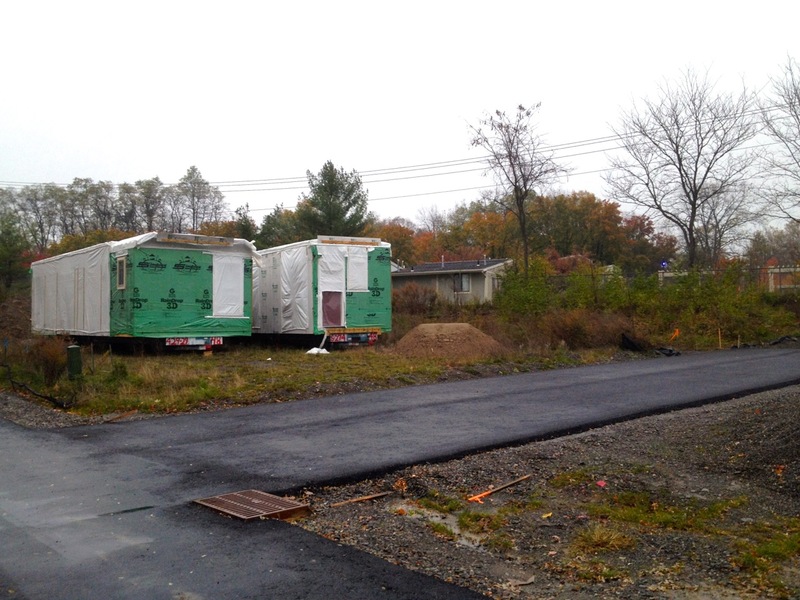 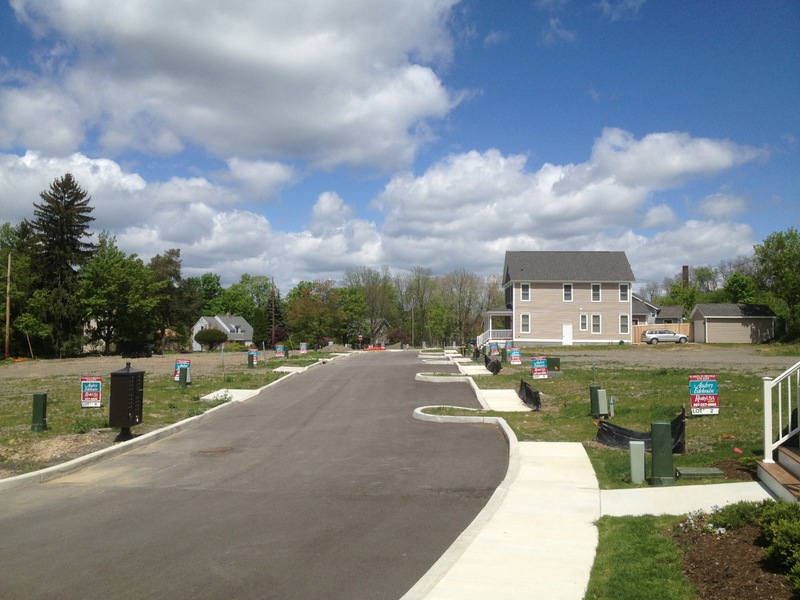 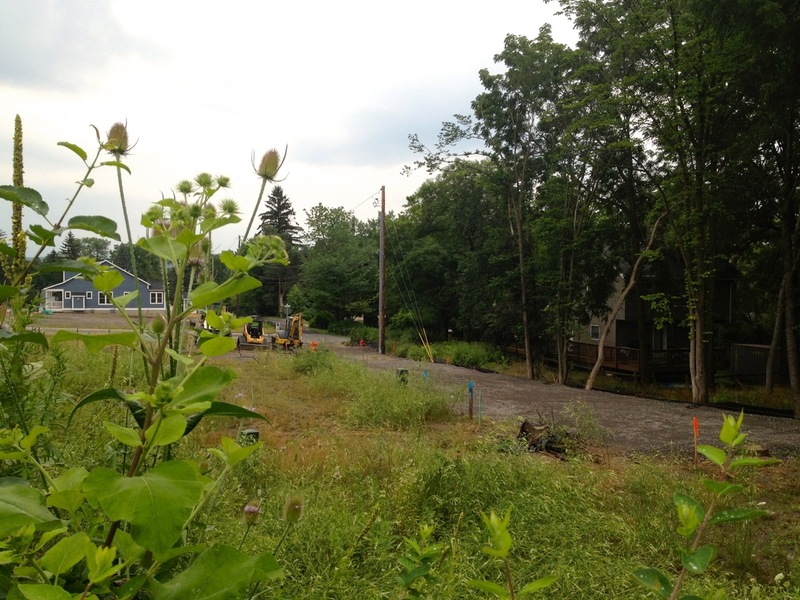 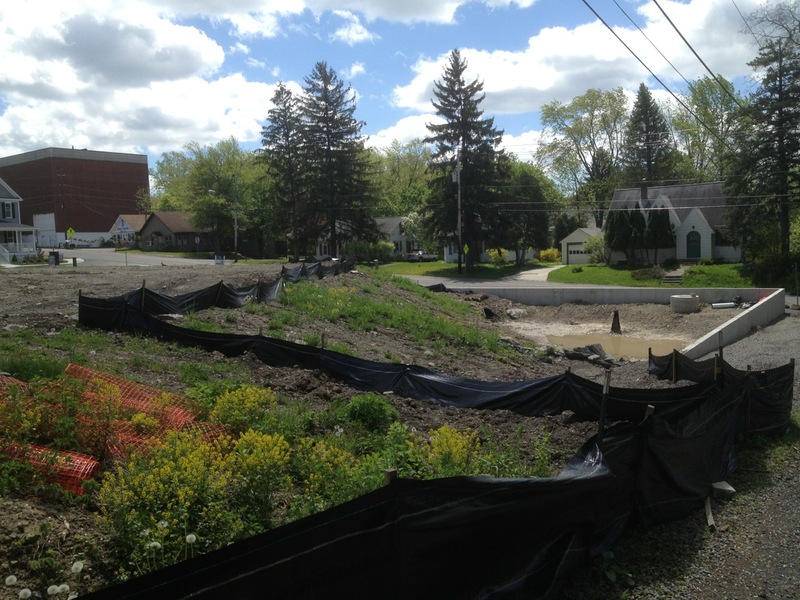 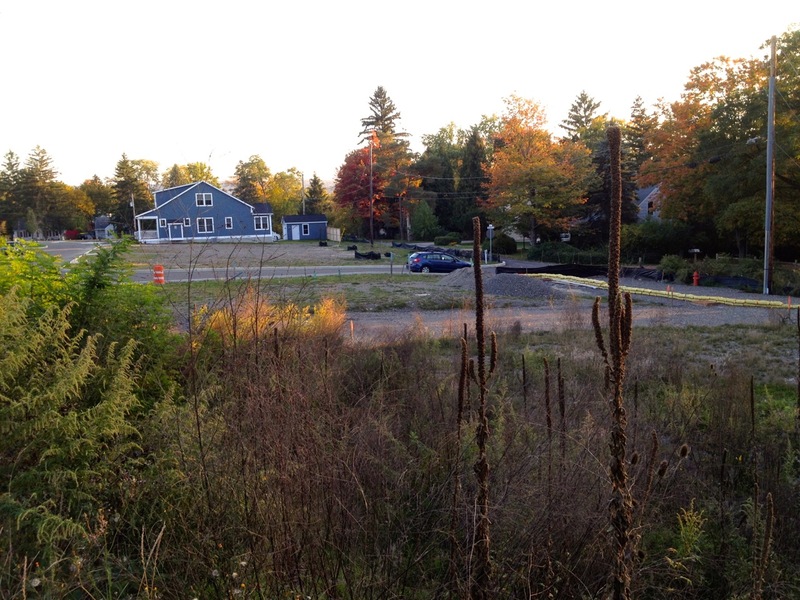 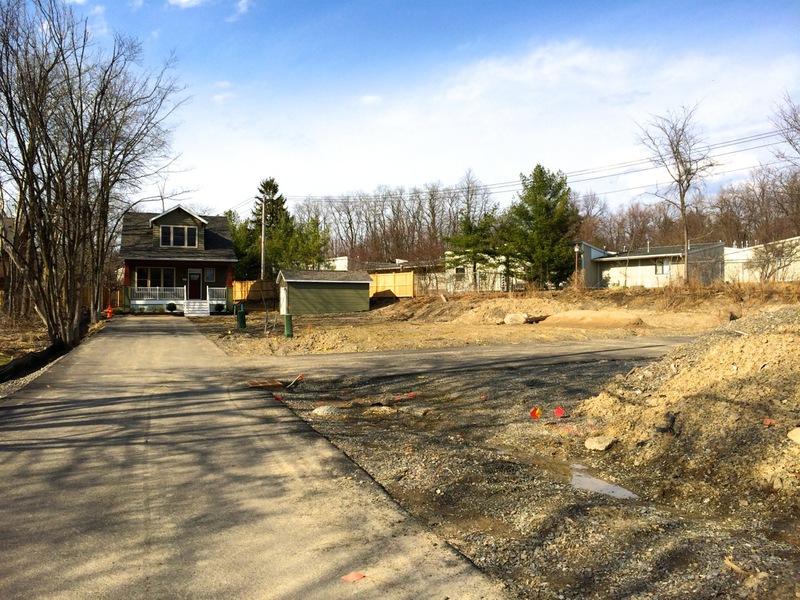 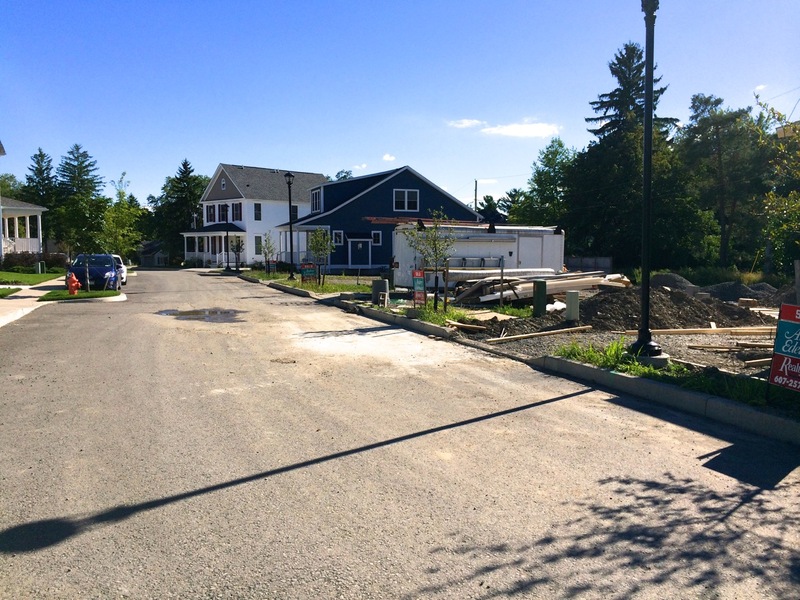 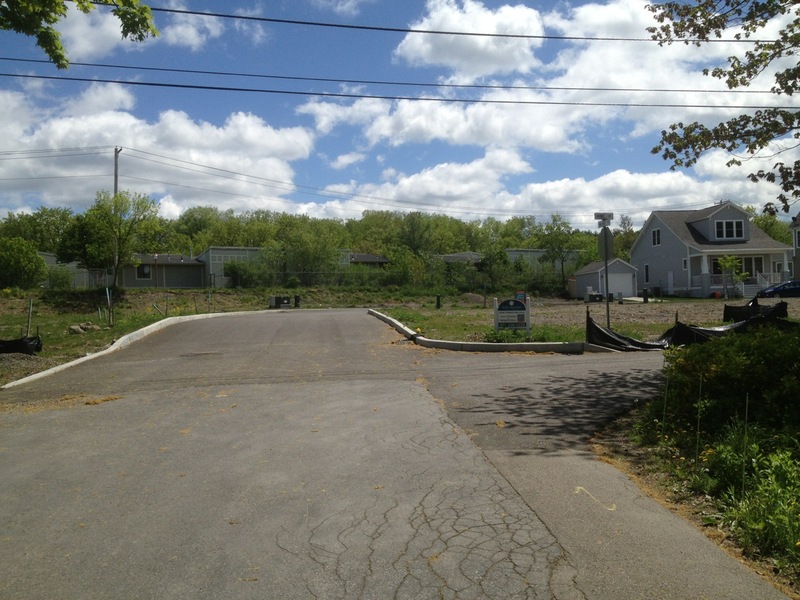 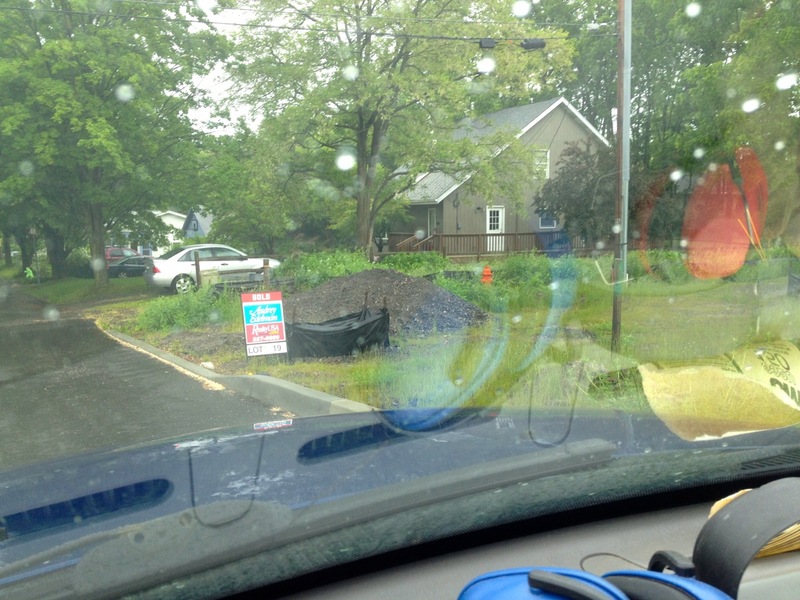 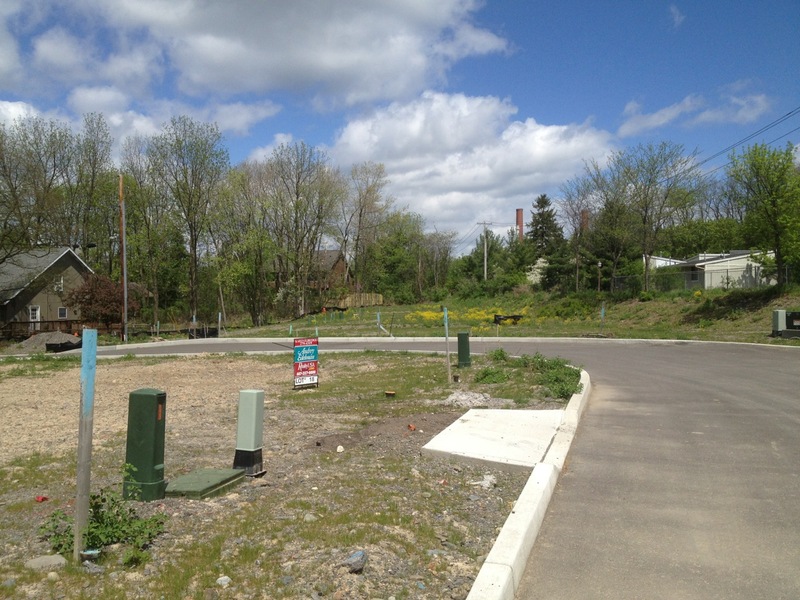 There’s a new gravel path towards Lot #19 (just sold, way in the back), so site work there should begin soon. 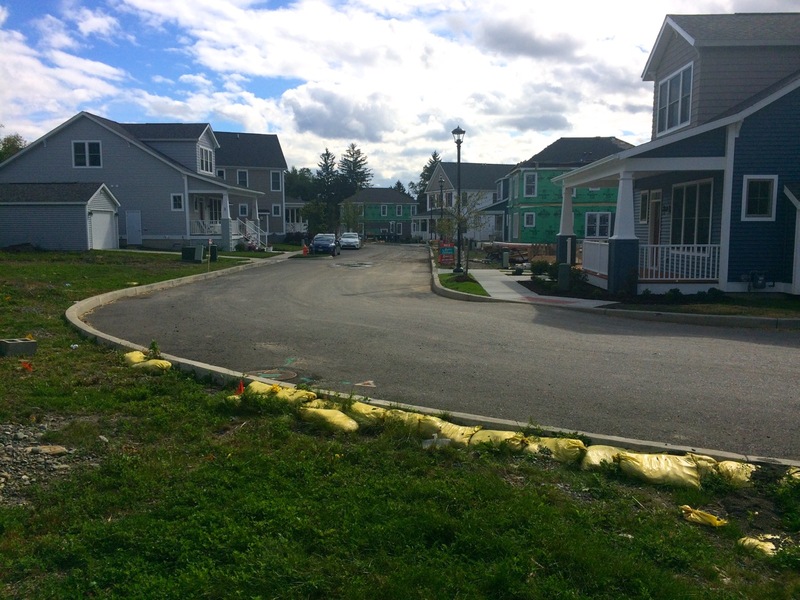 The planned townhouses will go north-south along this new path, and also east-west along an additional drive to be built going east. 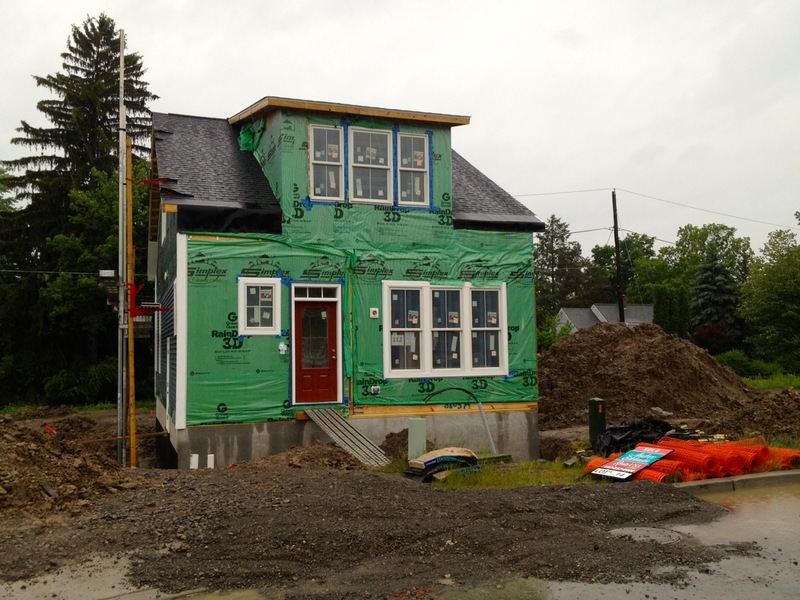 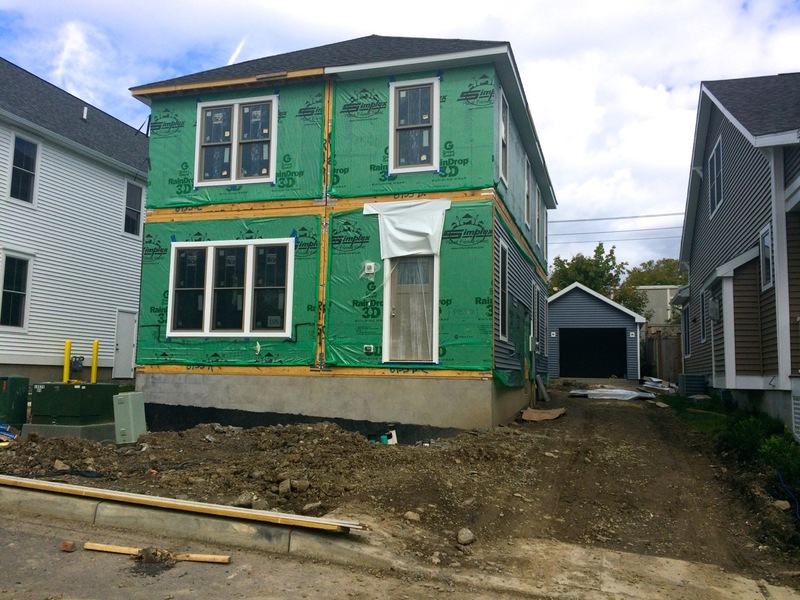 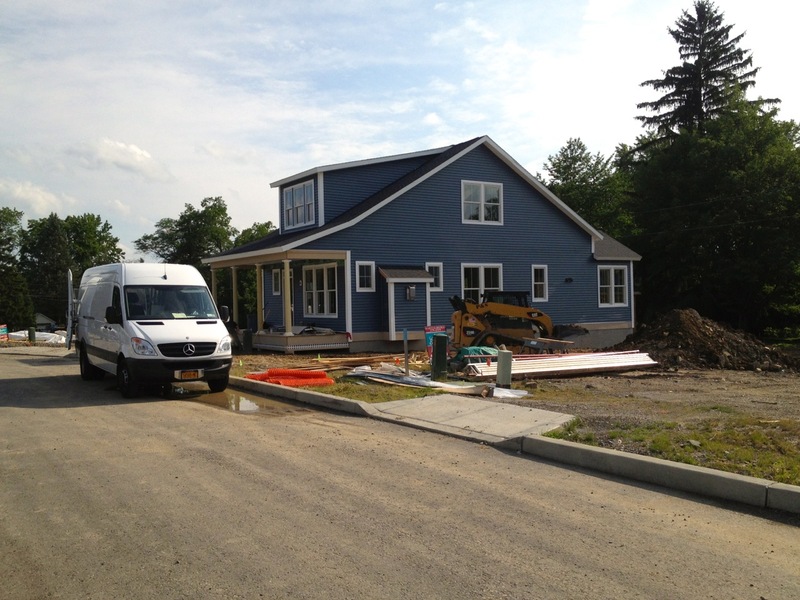 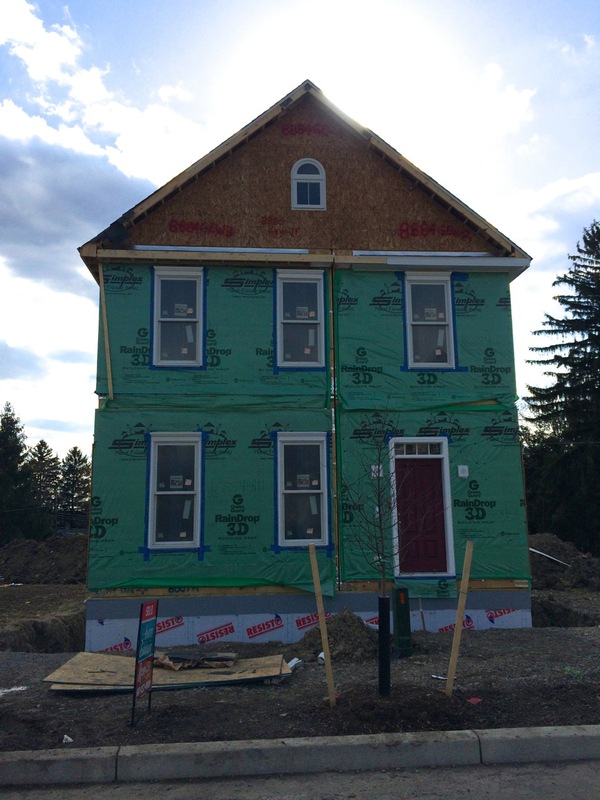 Lot #2’s house has begun siding work, and it looks like Lot #14 just needs a concrete truck and a few days to be all set. 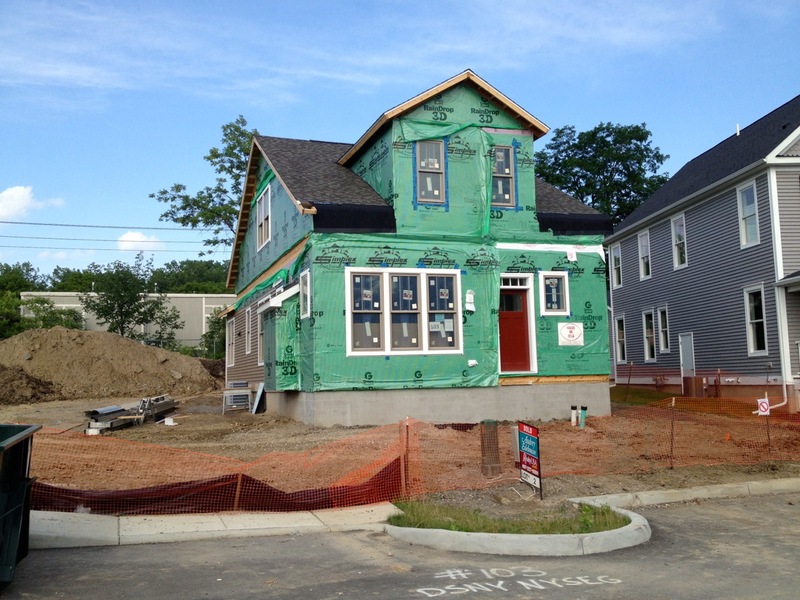 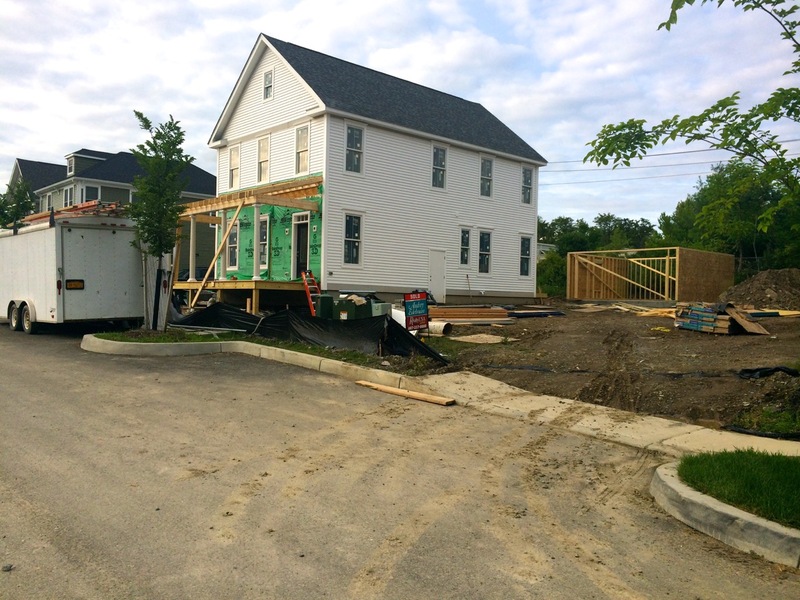 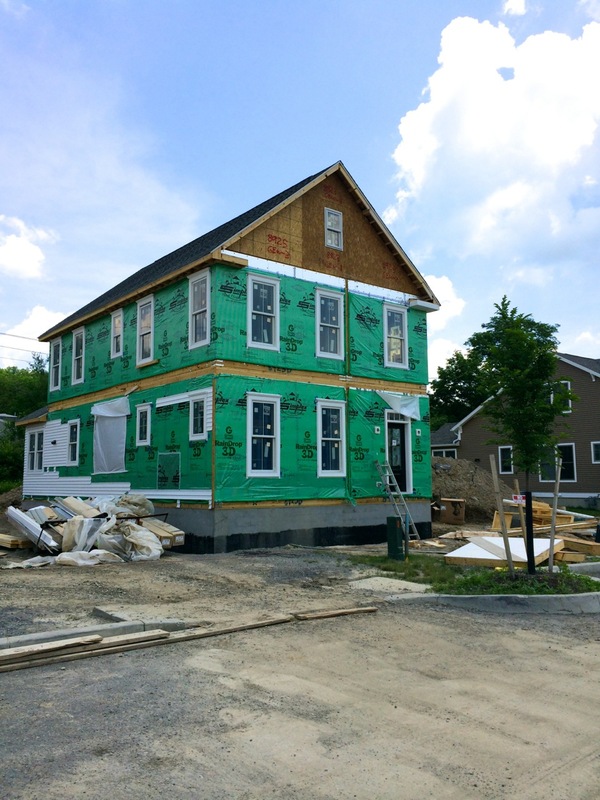 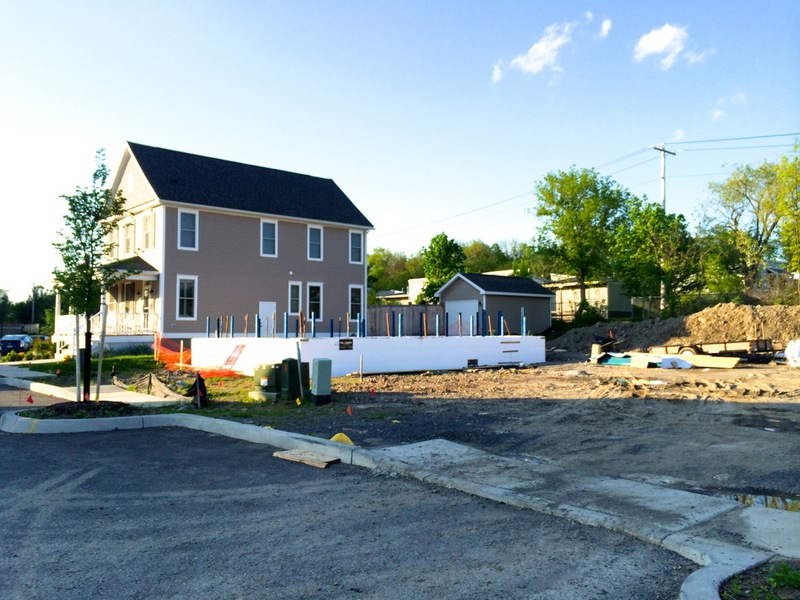 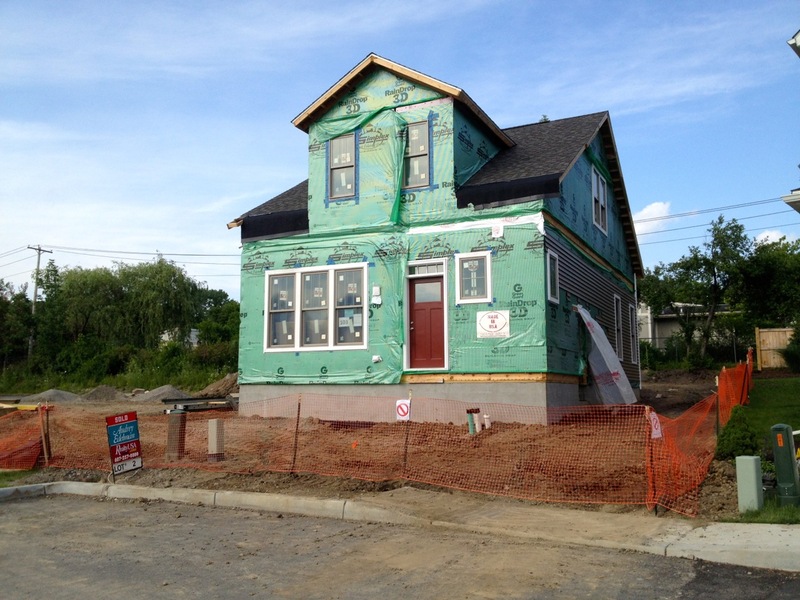 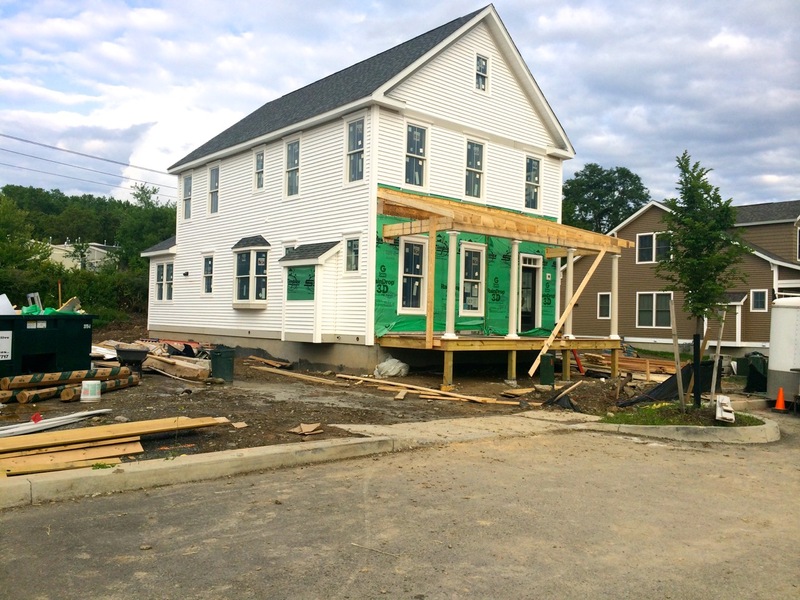 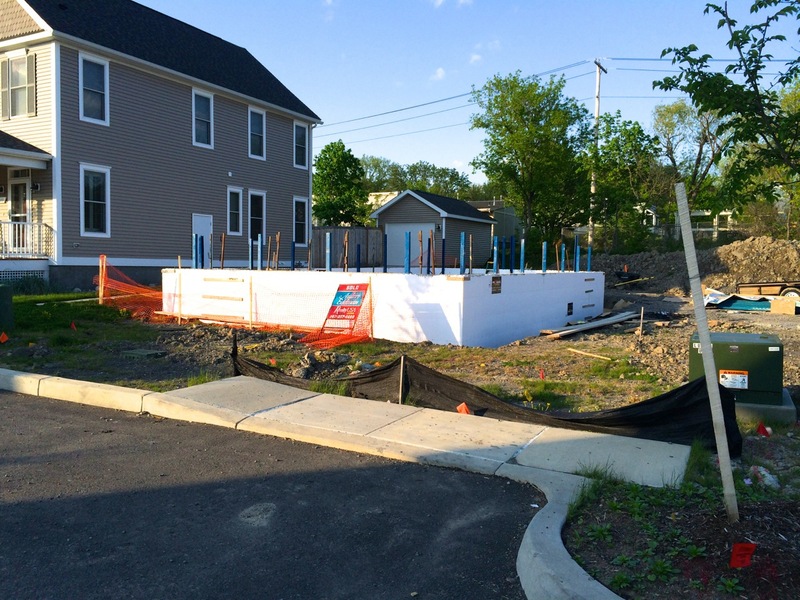 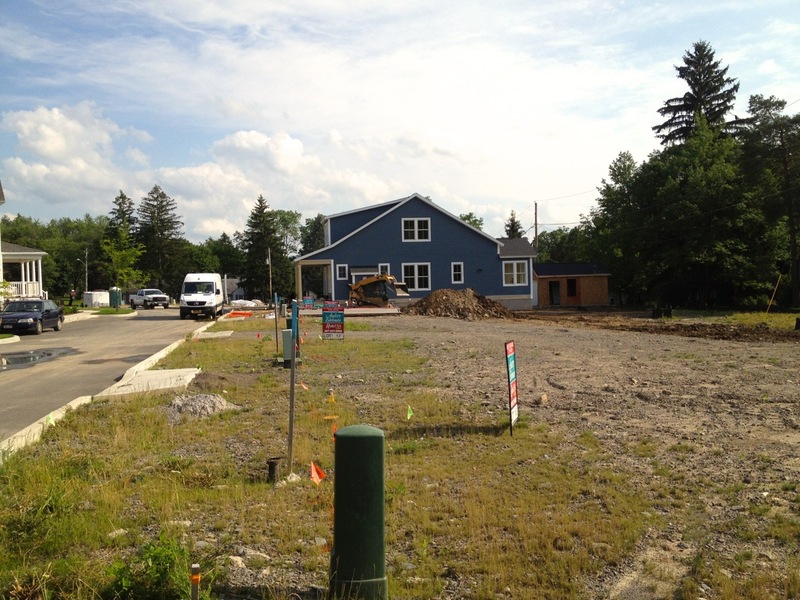 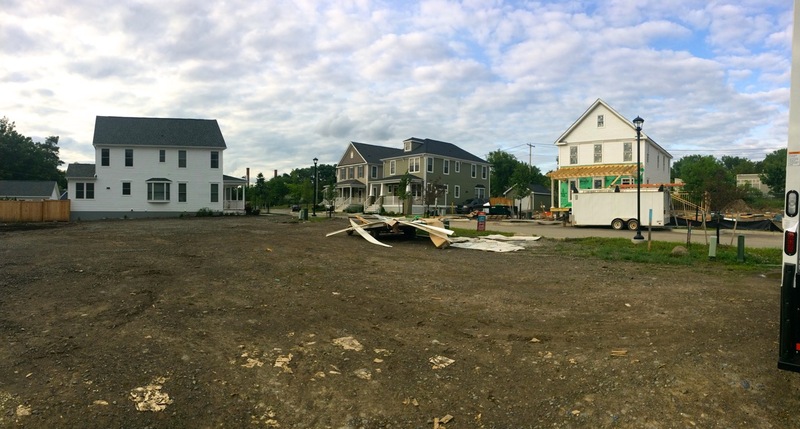 Definitely a quick turnaround- see the photos from June 7th, about a month ago: Lot #14’s house had just recently been put in place on the foundation. 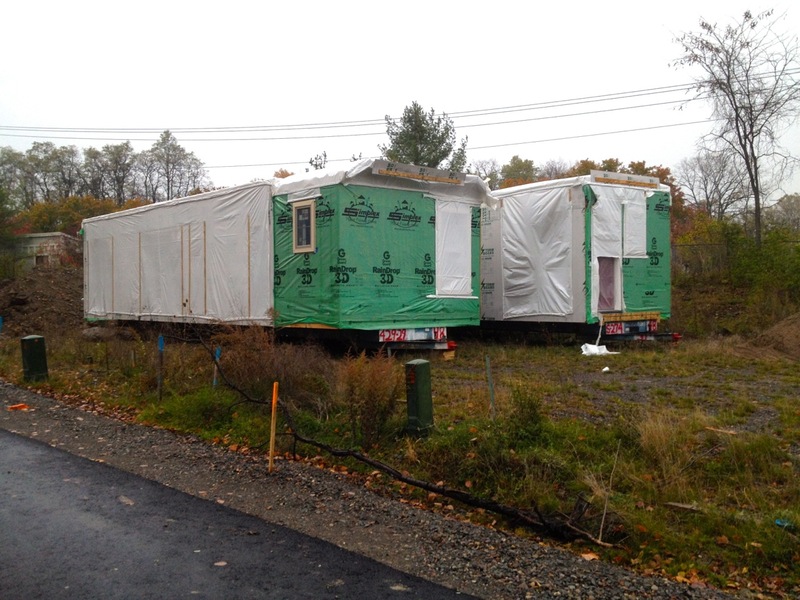 I was kindly invited to visit the morning of a modular assembly, so here are photos of the crane hoist, modular section, and the modular seam (once inside). 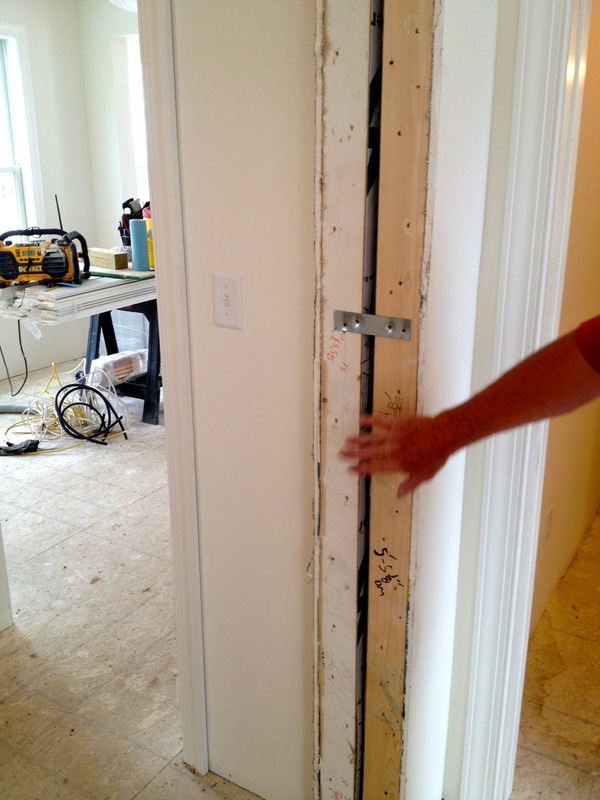 The art of this sort of construction assembly is fitting the pieces together perfectly so that all your seams line up. 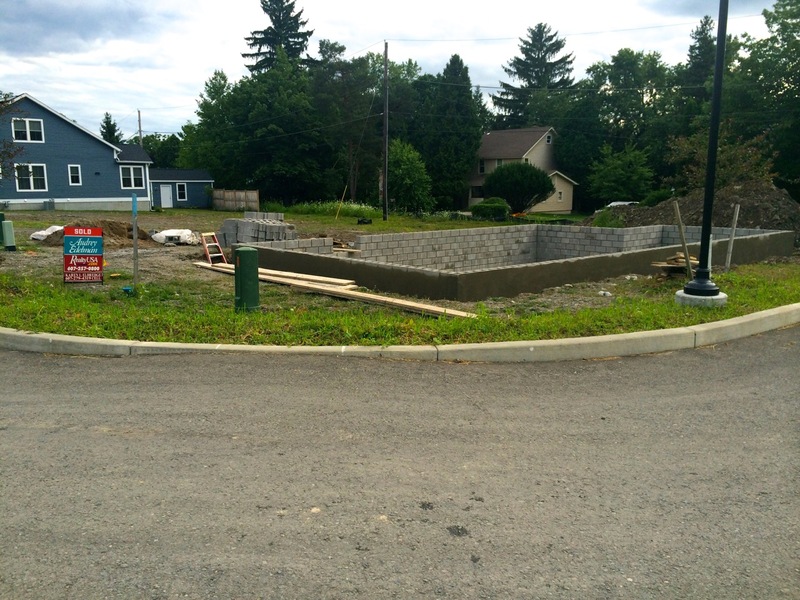 These sections are about 10′ x 30′ give or take a few feet. 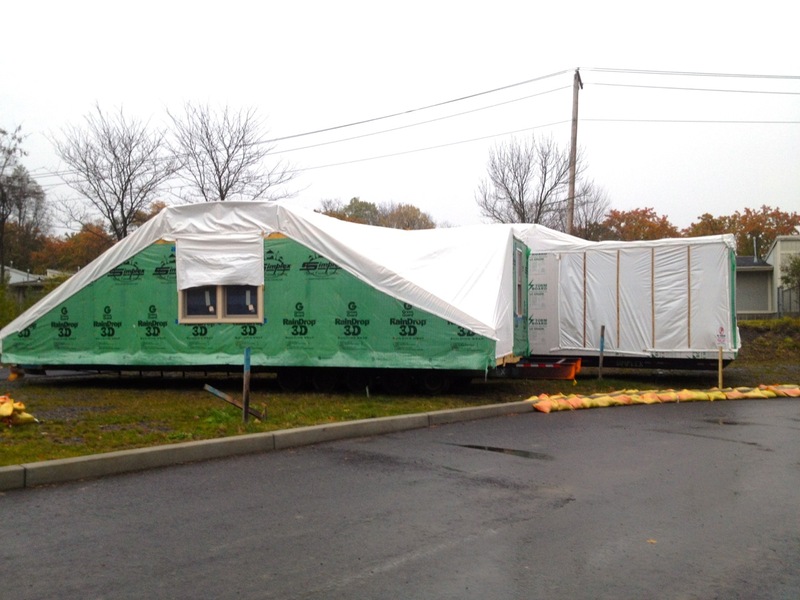 Some shifting and settling occurs when the units are being trucked from Pennsylvania, but everything must come together just right once it’s on site. 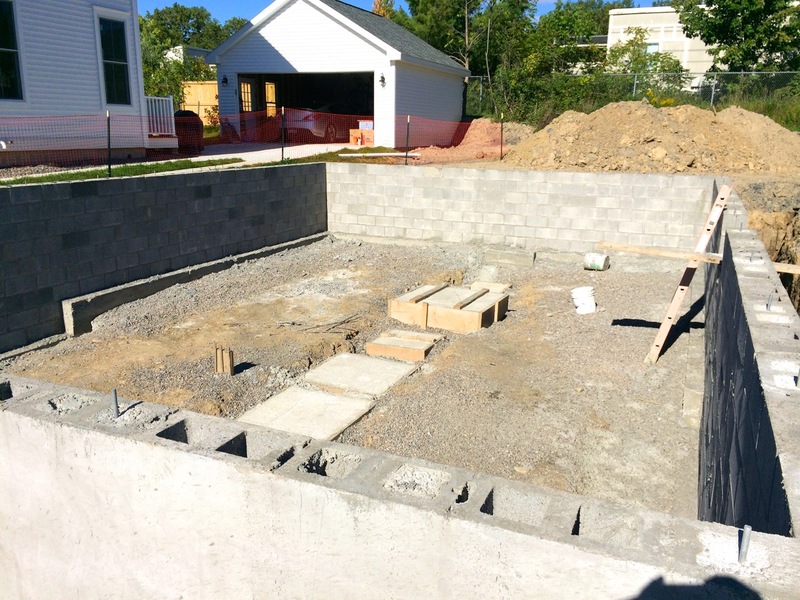 After leveling a few floor assemblies, it’s easy to see how this can get complicated because there are many more considerations when fitting these in, primarily that the distance is so much greater than a typical floor joist, so your multiplication factor for being off by just a bit turns into a lot more than that. 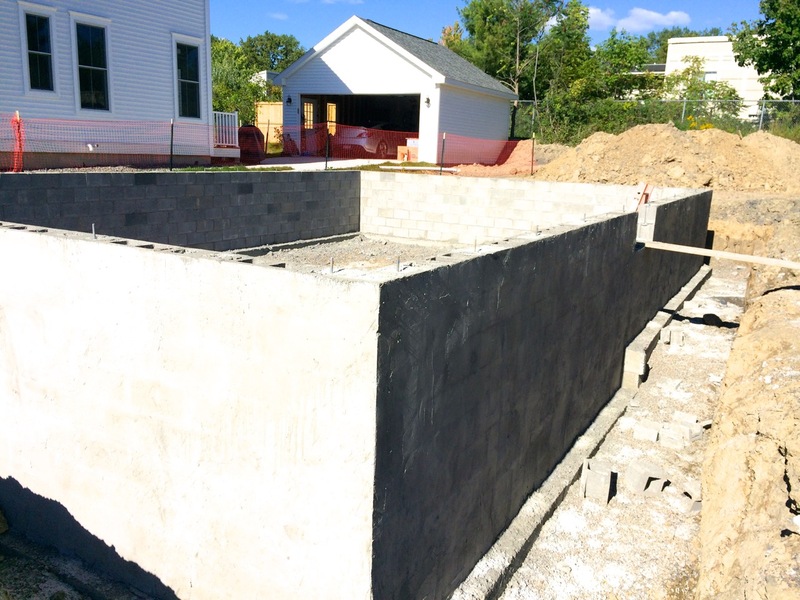 All in all, they appeared very well constructed, and once inside, it didn’t seem like I was walking into something that was once four separate pieces. 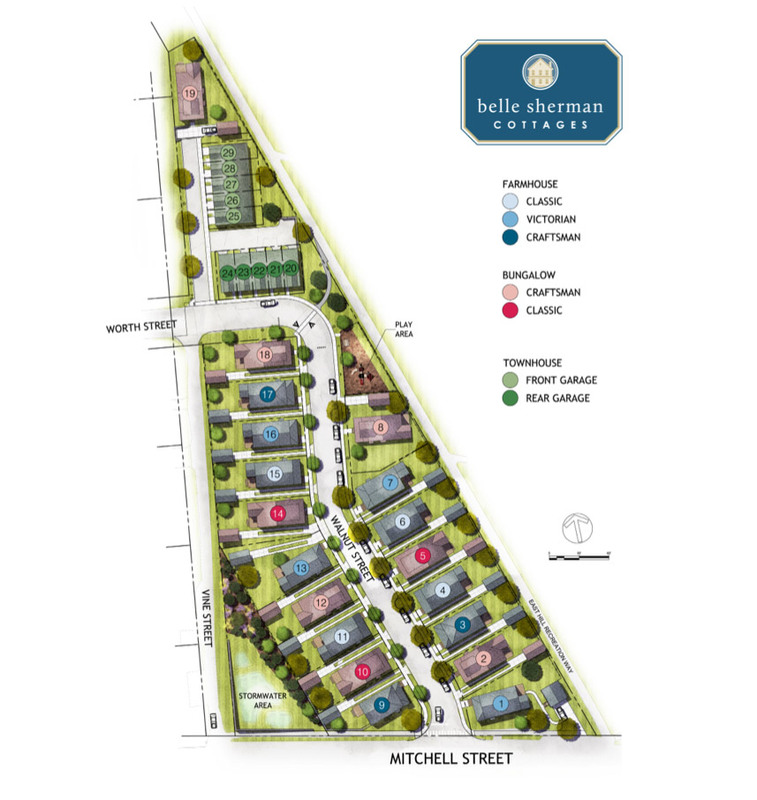 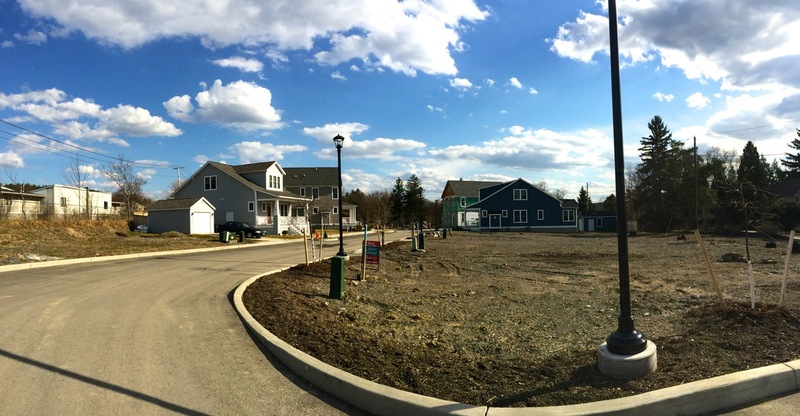 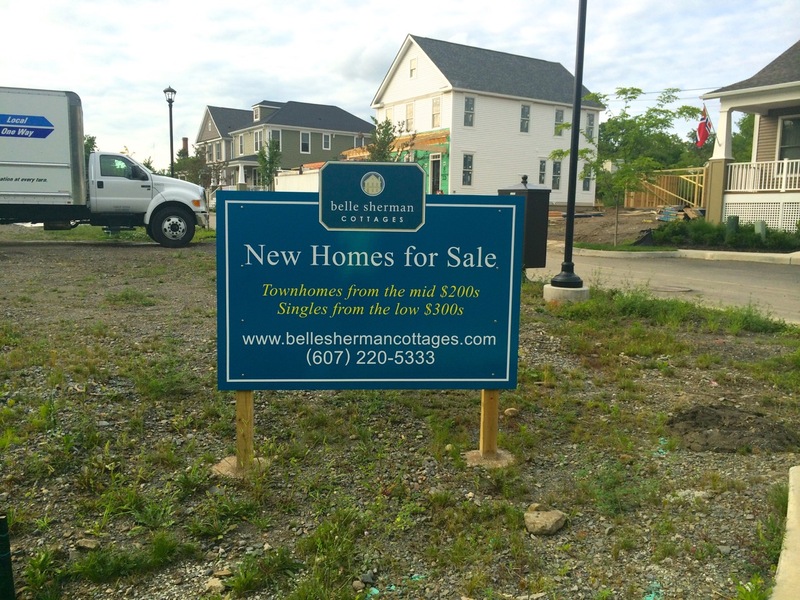 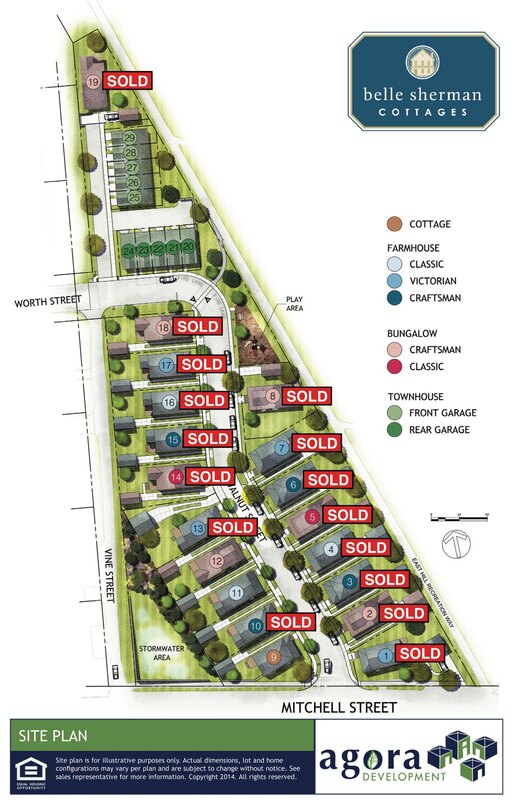 Looks like sales have picked-up, and Lot #2 and Lot #19 have joined the ranks of the parcels that have sold. 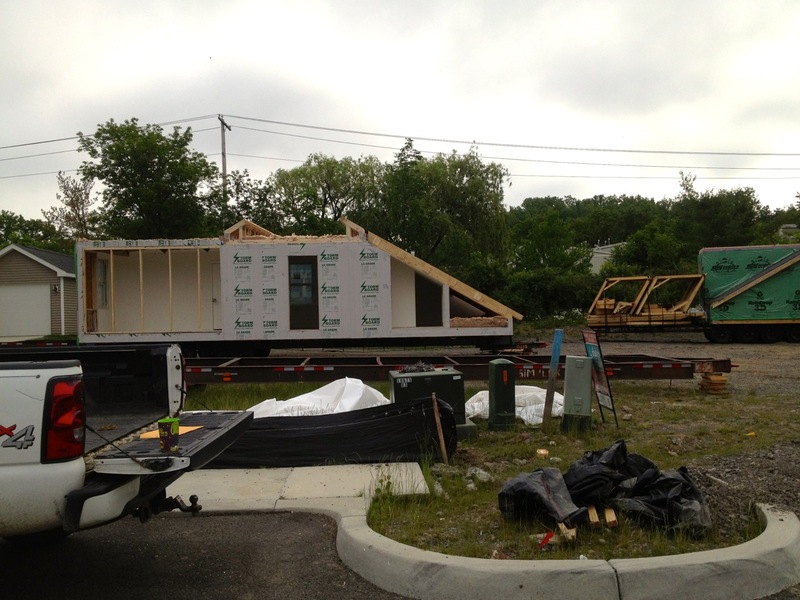 Lot #14’s modular pieces showed-up and have been speedily assembled. 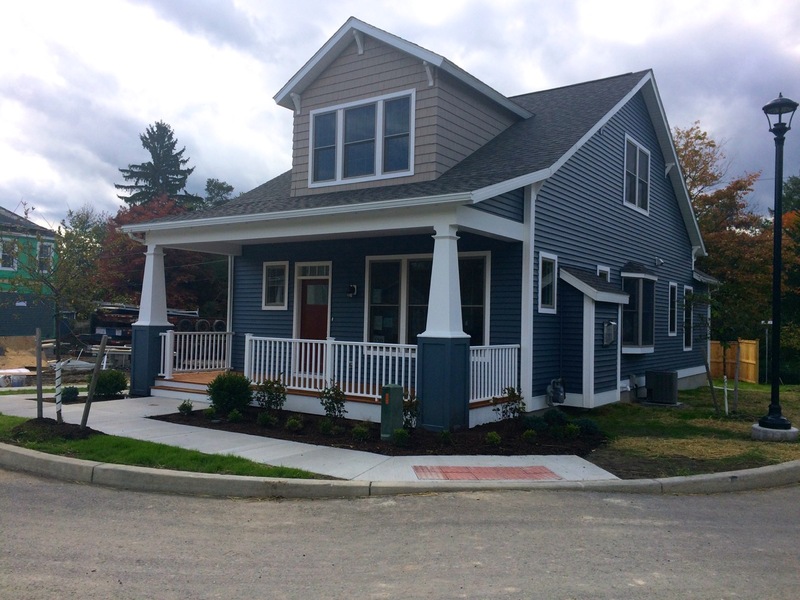 Local builders Carina Construction specialize in these Simplex Modular Homes, which have caught on due to their price, build quality, and increasing customization. 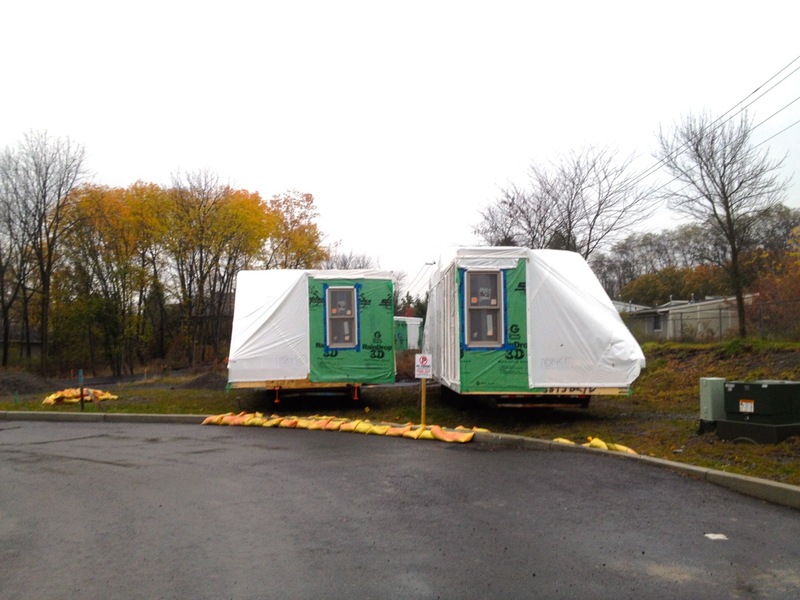 Early modular home units were plagued by narrow design possibilities, but now the opposite is true, and offerings have expanded to multi-family and even dormitory housing (their modern design products look quite cool too). 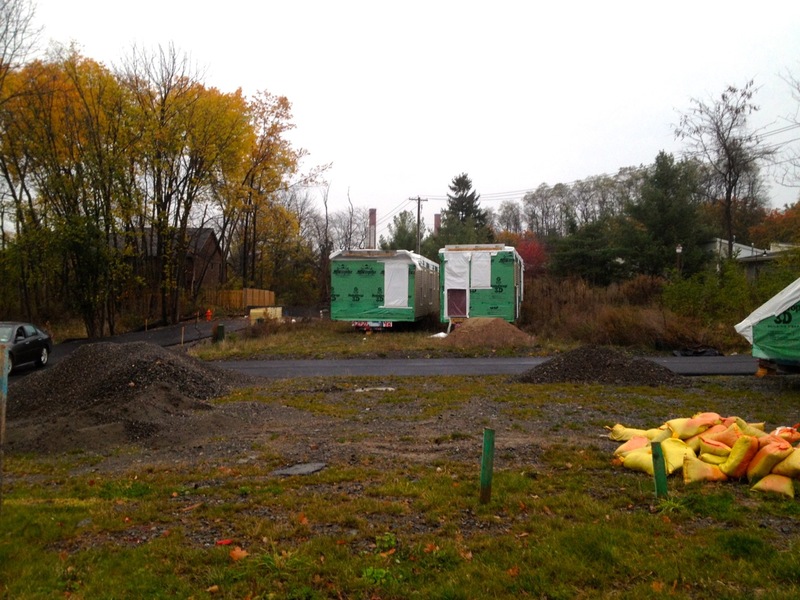 Once enough sales have been made, and these lots fill-in, I wouldn’t be surprised if we were to see the three-story modular townhouse units begin development towards the back end of the lot. 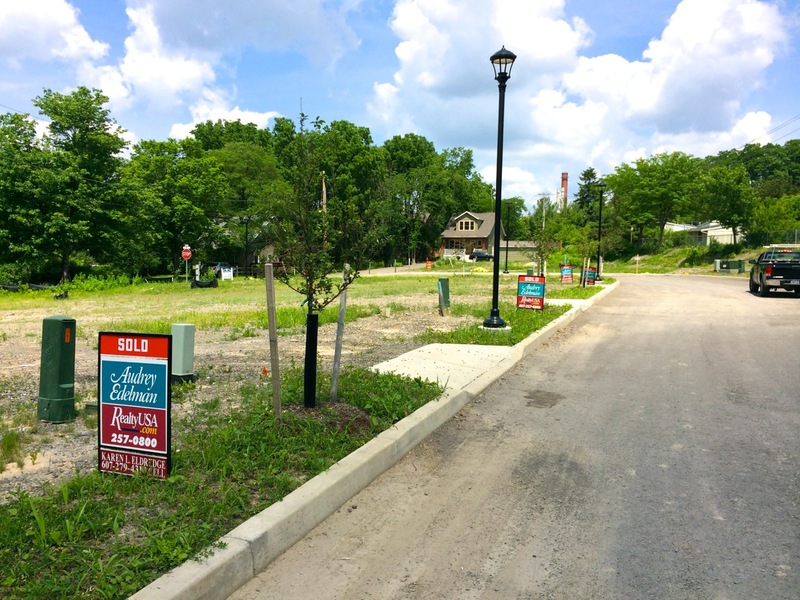 New signage for each lot has been put up within the past week or so, and it looks like we’ll see another house built- Lot #14 has sold, making a total of three (plus the model house, which has been up for some time). 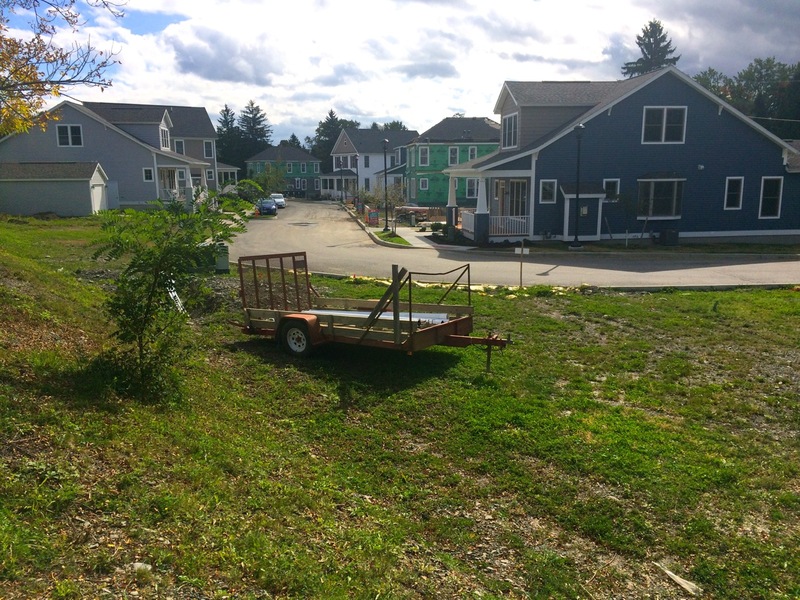 The photos of the back end of the parcel make the site look as if there’s no room for the townhouses in the back, but after taking a stroll around the site, it doesn’t seem as small. 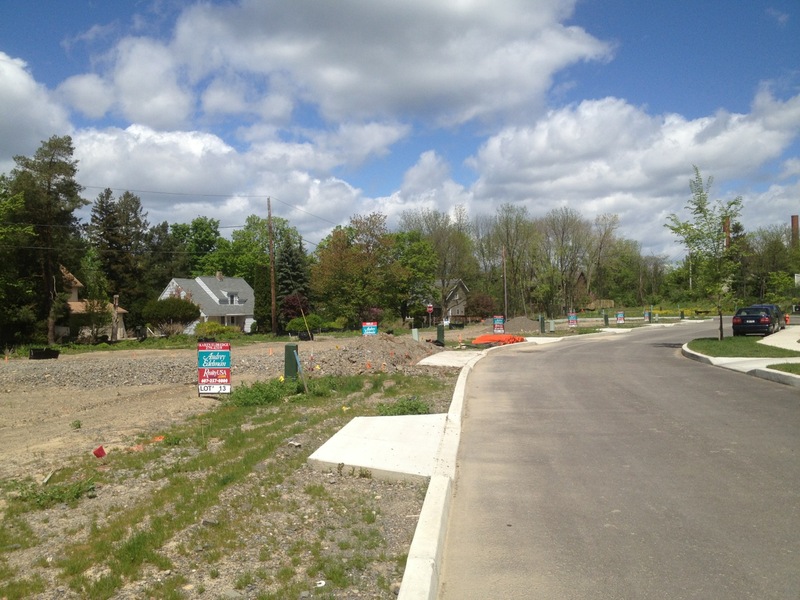 Once more houses are put up and vegetation grows in, it will probably seem a lot larger.